1 This monument is erected to the memory of Hugh Blair of Dunrod, Esq., by his mournful widow, who lost in him a faithful and an affectionate husband, his infant children a kind and tender father, his friends, a warm and generous friend, his tenants and servants, a just and gentle master, the poor and afflicted, a liberal benefactor. He died the 2nd of May 1771, aged 27 years. 2 Beneath this stone lyes the body of Mary Maxwell, daughter to Lieutennant Colonel William Maxwell of Cardoness & spouse to Alexander Blair, Dunroad, who died April the 5th 1762 years in the fourty seventh year of her age, and left behind her the following surviving children Viz,: Nicolas, Agnes, Henrietta, Hugh, William & Jean Blairs, and those deceased are Mary, Grissal & Margaret. This stone erected by her husband in testimony of her memory, October 1762 & year of God foresaid. 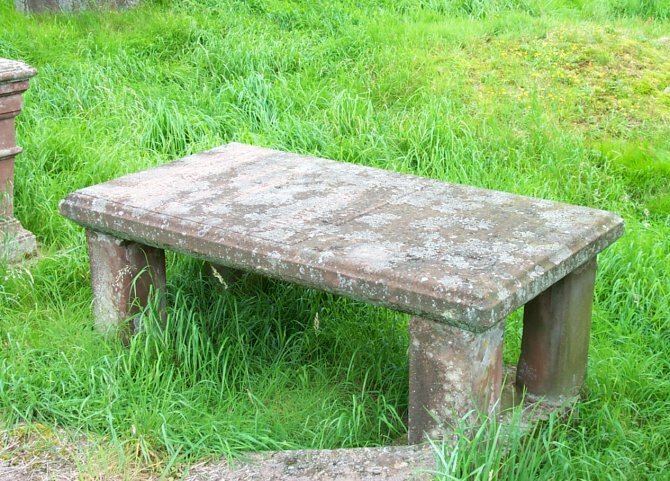 4 Sacred to the memory of Hugh Blair of Dunrod, died 2nd May 1771, aged 27. And of his relict Margaret Copland, second daughter of Alexander Copland at Colliston, born 22nd April (blank), died (blank) November (blank). 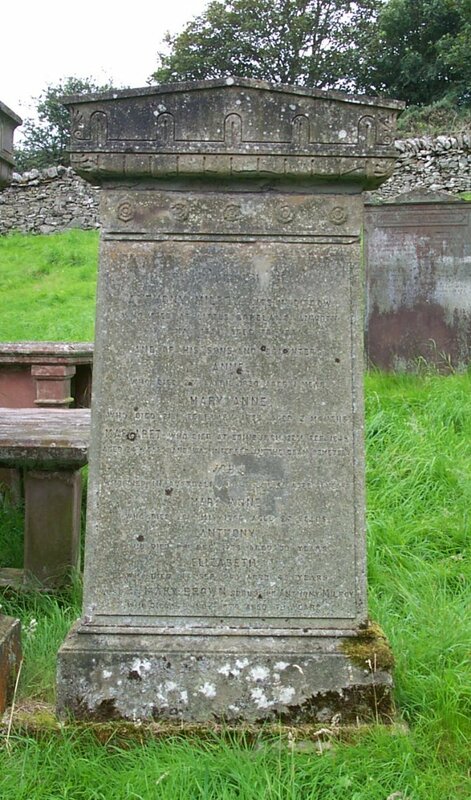 And of their son Alexander Blair of Auchenreoch, Writer to the Signet, born 8th September 1776, died 21st June 1848. 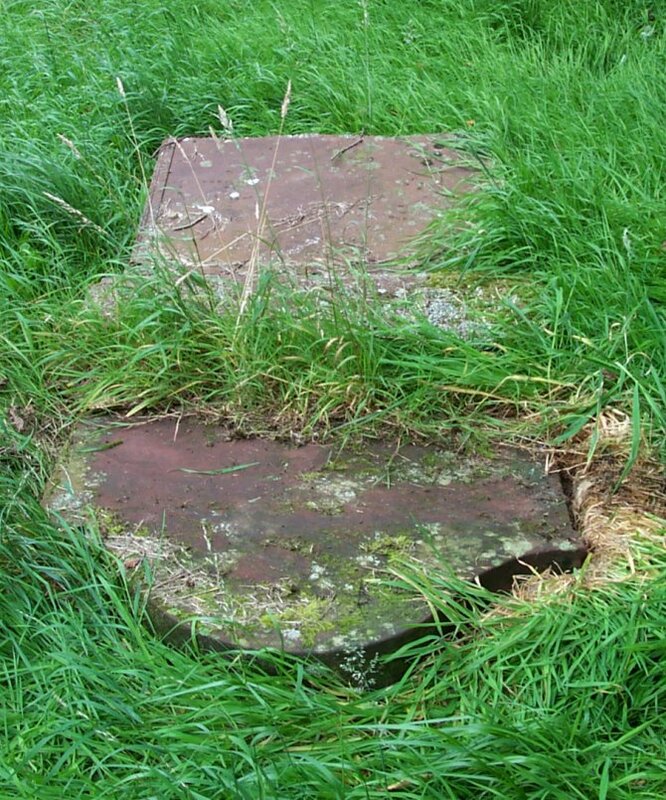 And of Agnes Maxwell, wife of the said Alexander Blair, and second daughter of Sir David Maxwell of Cardoness, born 25th June 1786, died 22nd May 1809, who together with her husband, is buried in the Calton Burying Ground, Edinburgh. And of Hugh Blair of Auchenreoch, Writer to the Signet, only son of the said Alexander Blair, born 21st March 1806, died 5th January 1878. He was interred in the Dean Cemetery, Edinburgh. And of Alexander Blair, Advocate, Sheriff of the Lothians and Peebles, eldest son of the said Hugh Blair, born 5th September 1834, died 4th October 1896. He was interred in the Dean Cemetery, Edinburgh. And of Robert Kerr Blair, Writer to the Signet, second son of the said Alexander Blair, Advocate, born 1st November 1876, died 14th January 1942. 5 In loving memory of Lt. Colonel Alexander Blair, 6th Duke of Connaught's Own Lancers, (Watson's Horse), Indian Armoured Corps, born 22nd November 1911, died 19th February 1959. 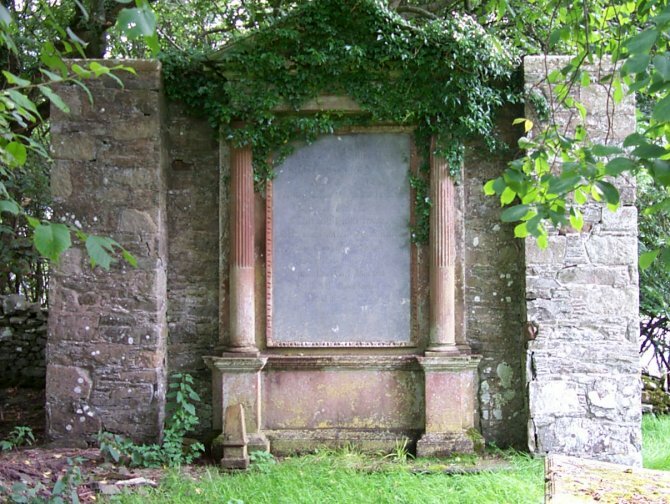 7 Sacred to the memory of Juliana J G Allimorf, spouse to Sir John Gordon of Earlston, Baronet, who died at Senwick House, 13th February 1824, aged 42 years. She was blessed with a benevolent heart and an honourable mind, and was to her husband a sincere, affectionate and loving wife. "I left this world without a tear, save for the friends I held so dear; To heal his sorrows, Lord, descend, and to the afflicted prove a friend." 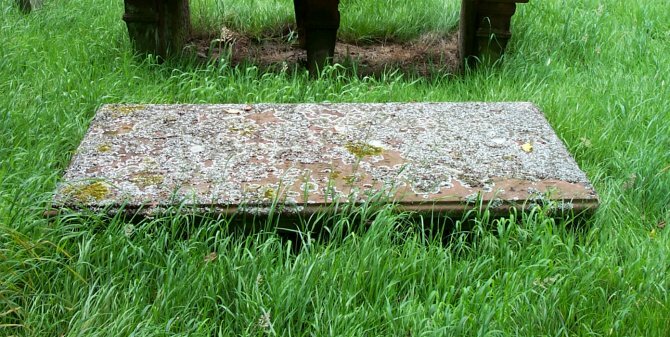 Here lies the corps of Jas. Sproat and Jean was buried here 1756. 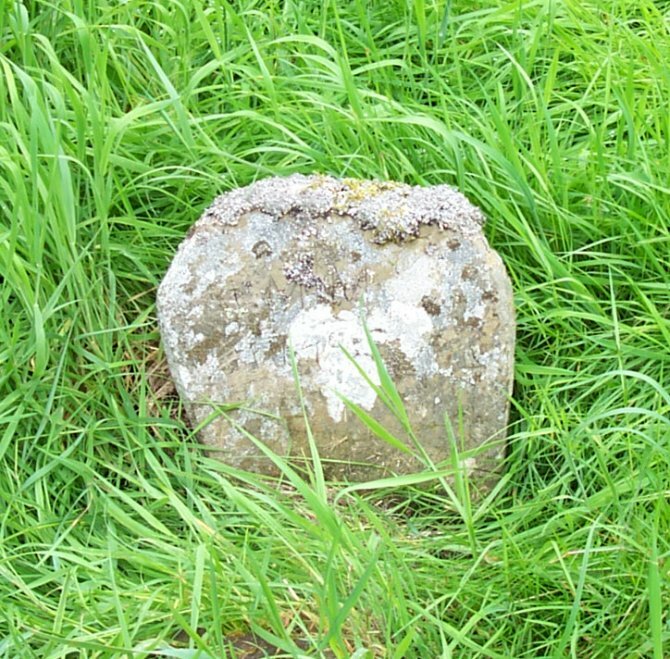 8a Here lyes John Carson of Balmangan, aged 59 years, who died ye 3d of Feb'y 1724. 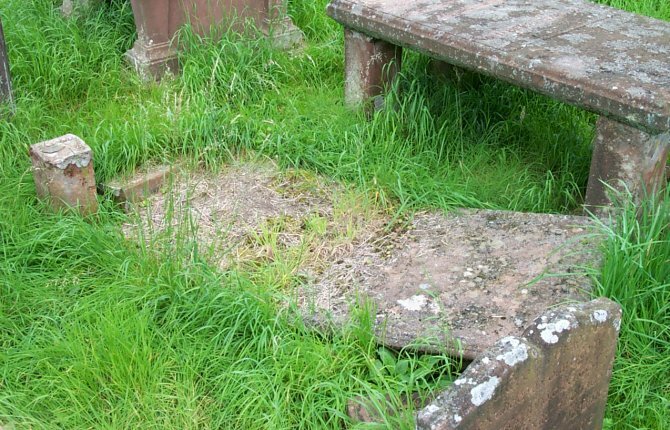 Here also lies Mrs Margaret Blair, firstly spouse to the above John Carson of Balmangan, afterwards to Mr John Gordon. 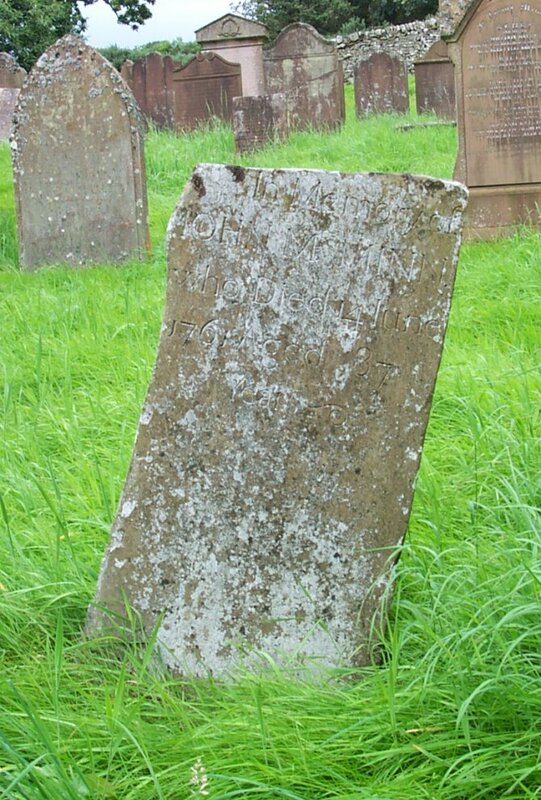 She died Feb'y 6th 1763, aged 71 years. 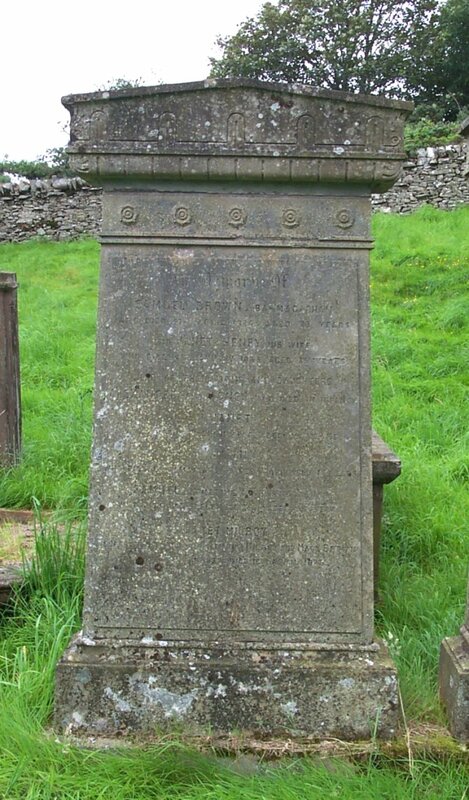 Erected in memory of John McTaggart, who died at Billies, Parish of Kelton, 1st October 1826, aged 65 years. And of Mary McKinnel, his spouse, who died there 22nd April 18--. 11 In memory of Sarah Rain, spouse to John McTaggart in Park of Senwick, who departed this life, Jan’y the 16th 1792, aged 64 years. 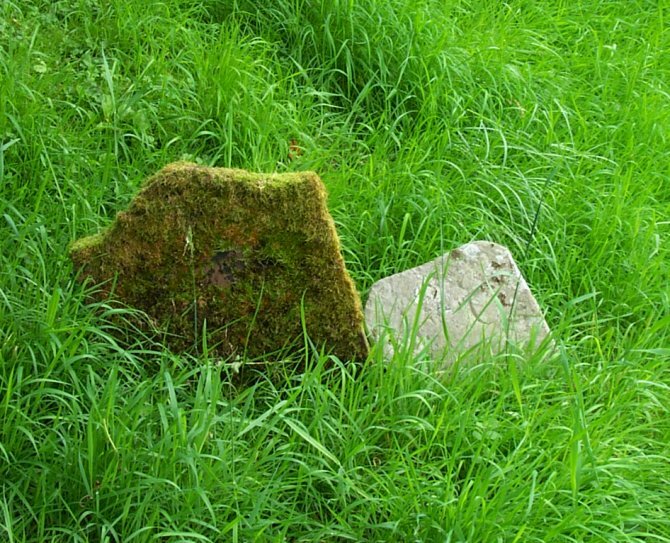 Also John McTaggart, her husband, who died at Senwick Park, February 9th 1815, aged 78 years. 12 Sacred to the memory of Hugh Stewart Campbell, Commander of the ship ' Ranee' of Liverpool, who died at Louis, Mauritius, on the 1st of August 1851 in the 34th year of his age. For what is your life, it is even a vapour, that appeareth, for a little time and then vanisheth away. James IV Ch., and XIV. 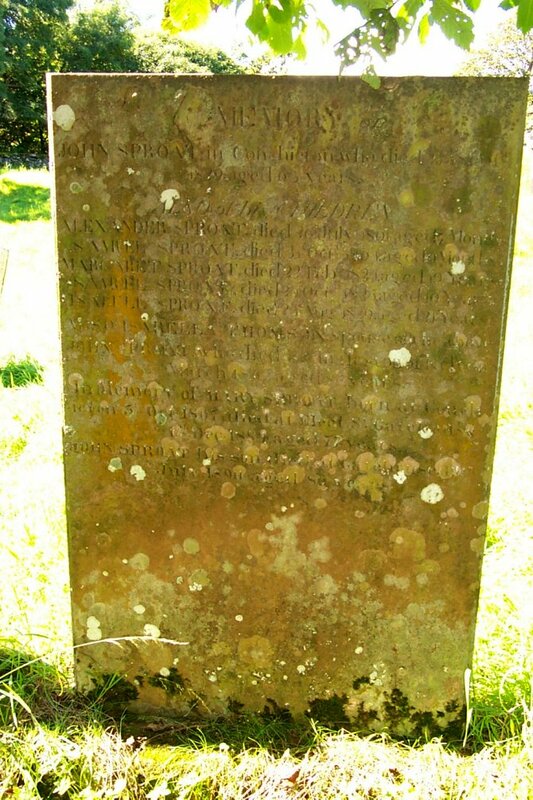 v.
13 Here lyes William Ewart, sailor, son of William Ewart of (illegible) who died Jan'y 11th 1746, aged 32 years. (Verse - illegible). Erected by Archibald Ewart (illegible). 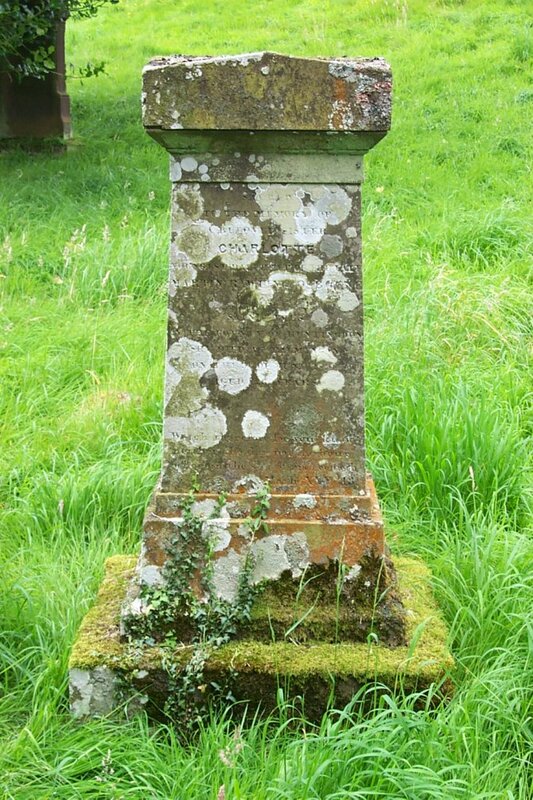 14 Erected by Samual McClune, in Ross, in memory of Alexander McClune, his son, who died 12 January 1772, aged 17 years. 15 In memory of Thomas Sproat, who died in Brighouse, 27th Dec’r 1787, aged 63 years. 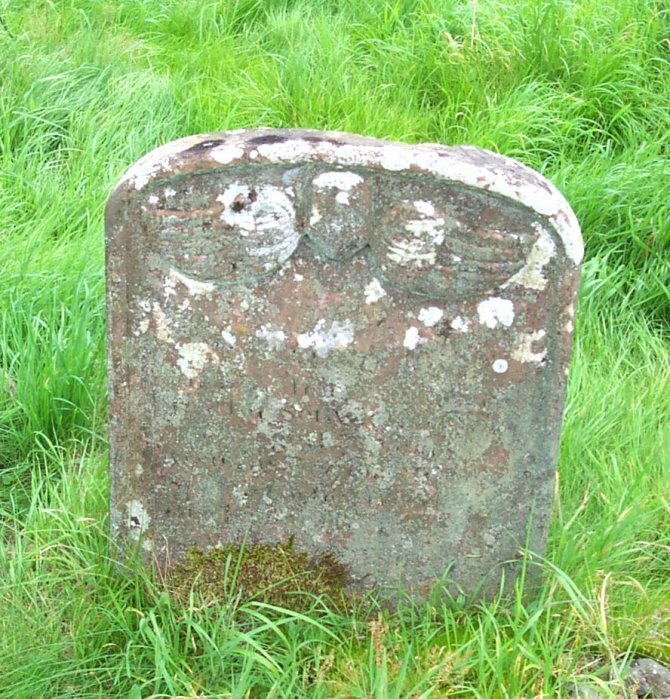 Also Agnes Carson, his spouse, died there 16th June 1795, aged 71 years. And Thomas Sproat, their grandson, died in Borness, 1st Jan’y 1811, aged 19 years. Also Mary, his sister, died 3rd July 1816, aged 21 years. Also their father, John Sproat, died there 11th April 1820, aged 61 years. And Isabella, his daughter, died 15th April 1824, aged 27 years. Penelope, her sister, died 1st Sept’r 1826, aged 16 years. 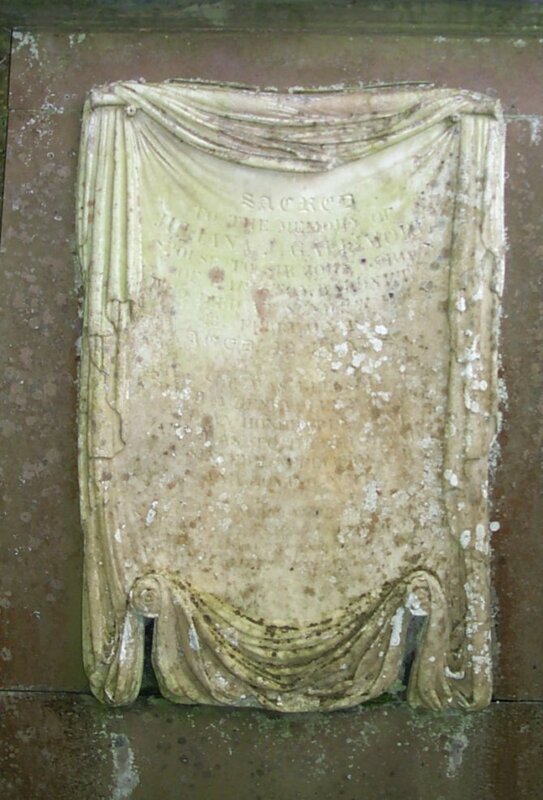 Also Margaret Corrie, relict of the above John Sproat, who died in Senwick, 21st May, 1848, aged 79 years. And Jane Sproat, their daughter, died there on 22nd Feb'y 1854 aged 49 years. 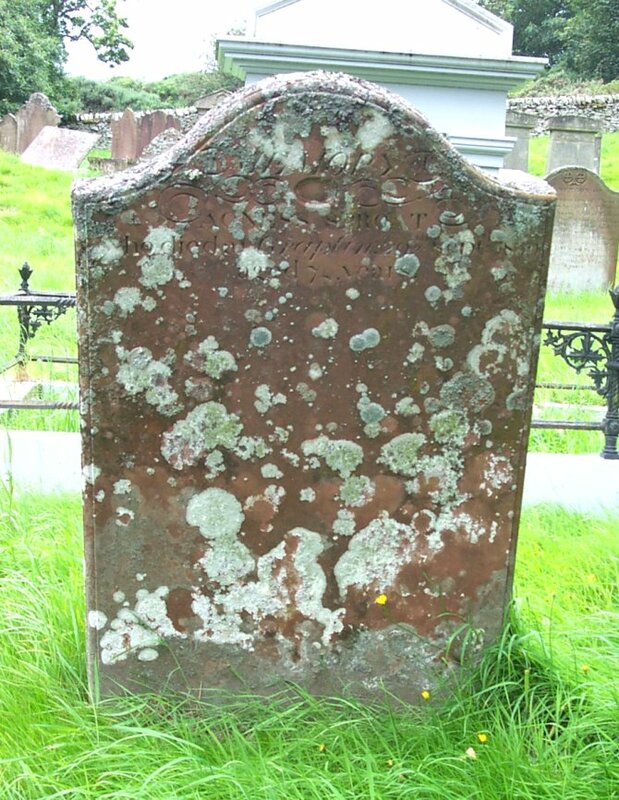 Also Margaret, her sister, died at Senwick, 8th May 1860, aged 70 years. And Hugh Sproat, their brother, who died at Senwick, 20th Dec. 1863, born 29th Jan’y 1807, he commanded a merchant ship from London to Sidney many years. Also John Sproat, who died Borness, June 1831, in infancy. John, his brother, died 5th June 1835, aged 16 months. And Jane Henry, who died in Edinburgh, 21st Feb’y 1845, aged 23 years, grandchildren of the above John Sproat & Margaret Corrie. 16 Erected to the memory of Margret Tait, spouse to Alexander Sproat in Conchietown, who died 13th Feb'y 1786, aged 51 years. Alexander Sproat, died 26th March 1807, aged 77 years. 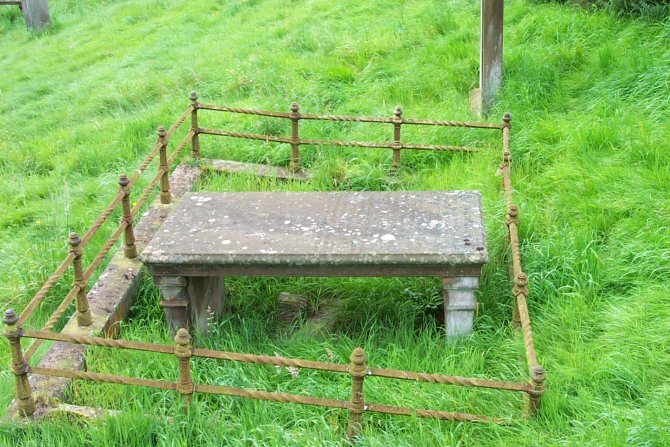 17 Erected by John Sproat, in Kempleton, in memory of Jane McTaggart his spouse, who died 26th December 1803, aged 48 years. Also his son Isaac, who died 6th March 1800, aged 6 months. Also his son John, who died 1st November 1822, aged 31 years. Also his daughter Isabella, who died 11th Novb’r 1824, aged 34 years. And William his son, who died at Kempleton, 12th Jan. 1850, aged 63 years. The above John Sproat, late in Kempleton, who died 22nd Dec'r 1850, aged 93 years. 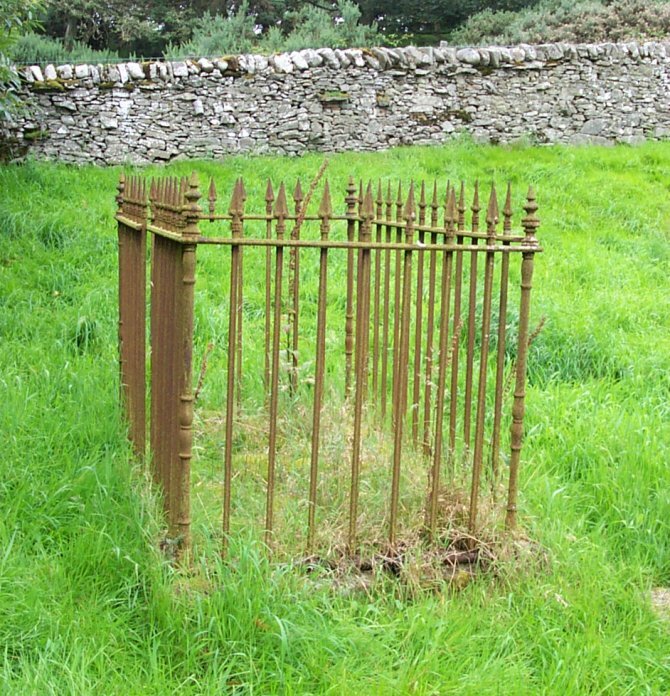 18 In memory of James McTaggart, who died at Torrs of Kirkcudbright on the 21st of January 1832, aged 75 years. And his wife, Mary Sproat, who died 29th May 1829, aged 57 years. 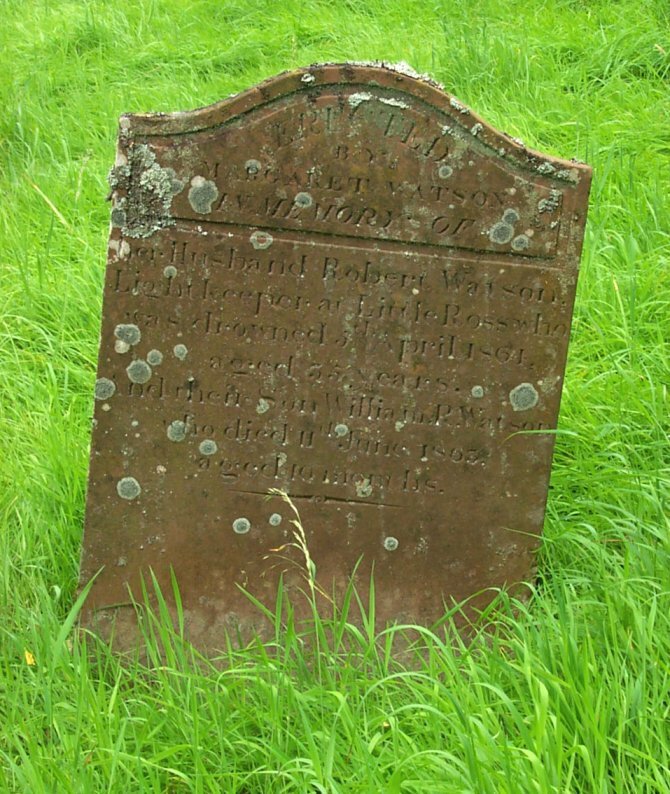 Also of the following, their children: Mary who died March 1817, aged 7 years. Margaret, who died 14th April 1817, aged 21 years. Isabella, who died 17th July 1829, aged 34 years. 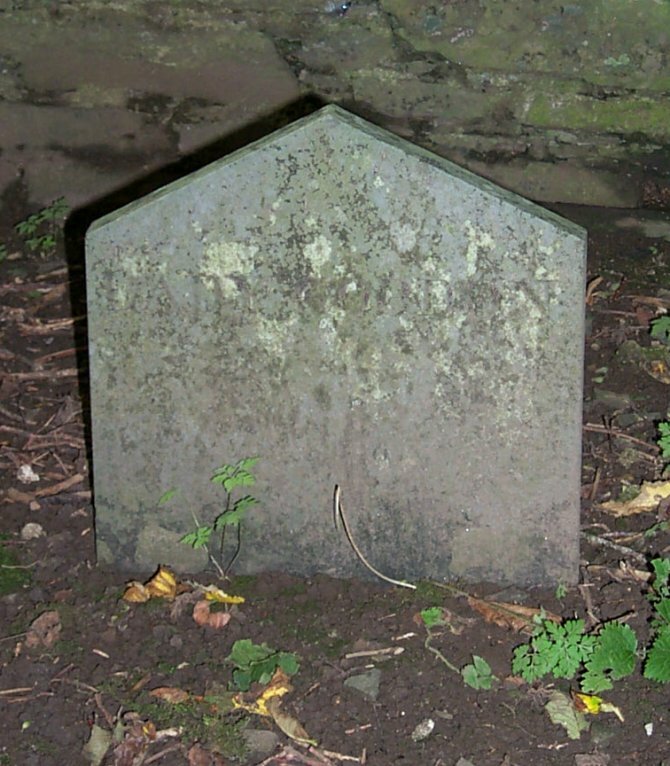 John, who died 8th January 1830, aged 32 years. 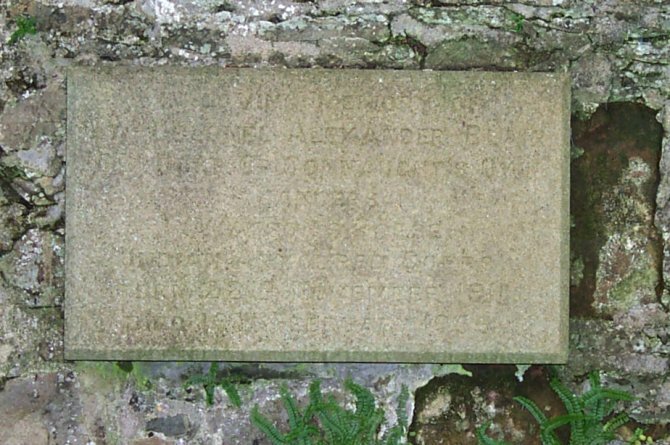 Alexander, who died 13th May 1833, aged 29 years. Also James McTaggart, who died 17th August 1847, aged 46 years. Isaac McTaggart, who died at Ottawa City, Upper Canada, 18th Dec. 1864, aged 57 years. Also William McTaggart, who died at Underwood on 5th May 1868, aged 52 years. Also Eliza Cunningham, spouse to George McTaggart , who died at Overlaw, 6th October 1872, aged 55 years. Also George McTaggart, of Overlaw, who died at Castle Douglas, November 19th 1878, aged 74 years. 18a (Front) Dedicated by his loving son Howard E Sproat II, May 20 1989, in memory of Howard E Sproat, USA, May 20 1889 - August 25 1963. Son of Josephus, 1862 - 1947. Son of Robert, 1821 - 1902. Son of William, 1782 - 1862. Son of Alexander, Borgue 1740 - 1825 Idaho. Son of John, Mill of Plunton 1720 - 1800 Penn'a. Son of John Sproat and Elizabeth Johnson of Brighouse. (Rear) Also the erector Howard Elwood Sproat II, FSA (Scot), Dec. 23rd 1919 - Jan. 24th 1999. 19 In memory of Thomas Sproat, who died at Brighouse, 15th April 1814, aged 52 years. Also Agnes, his daughter, who died Sept. 3rd 1819, aged 17 years. 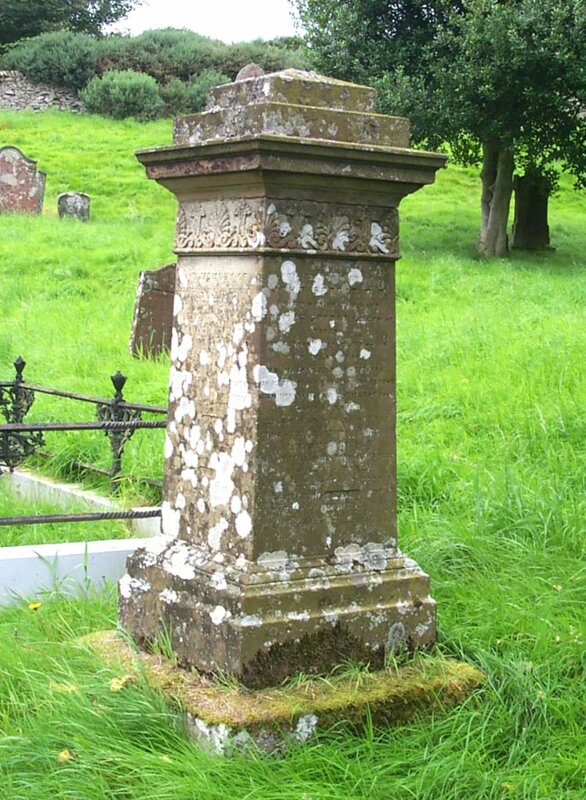 Also Hugh, his son, who died 2nd April 1838, aged 23 years. Also Mary, his daughter, who died 21st Septem’r 1838, aged 32 years. Also Nicholas, his daughter, wife of Peter Kerr of Manchester, who died there 15th June 1839, aged 31 years. Also Catherine May, their daughter, who died at Rockville on the 4th of March 1842, aged 3 years. Also in memory of Mary Brown, spouse of the above Thomas Sproat, who died on the 14th Nov'r 1853, aged 79 years. "For if we believe that Jesus died and rose again, even so, them also which sleep in Jesus, will God bring with him." 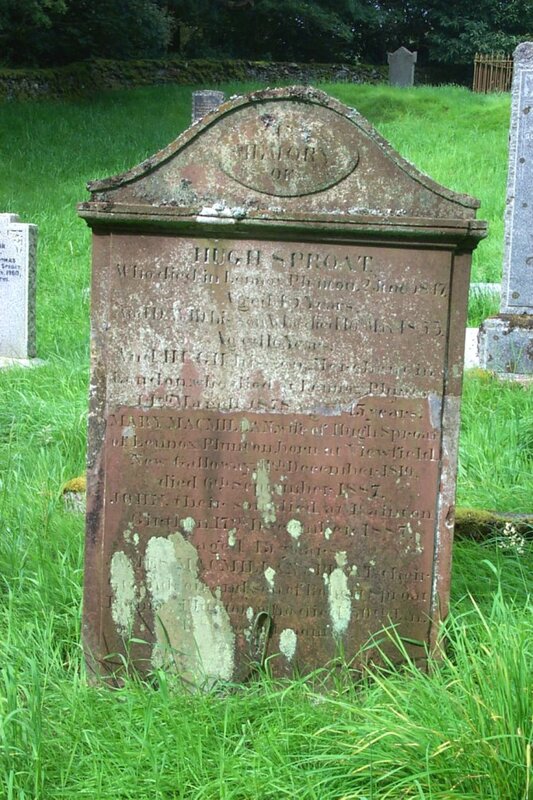 20 In memory of Hugh Sproat, late in Rainton, who died 3rd May 1825, aged 60 years. And John his son, who died 22nd June 1825, aged 14 years. Also Adam his son, who died 15th May 1826, aged 25 years. 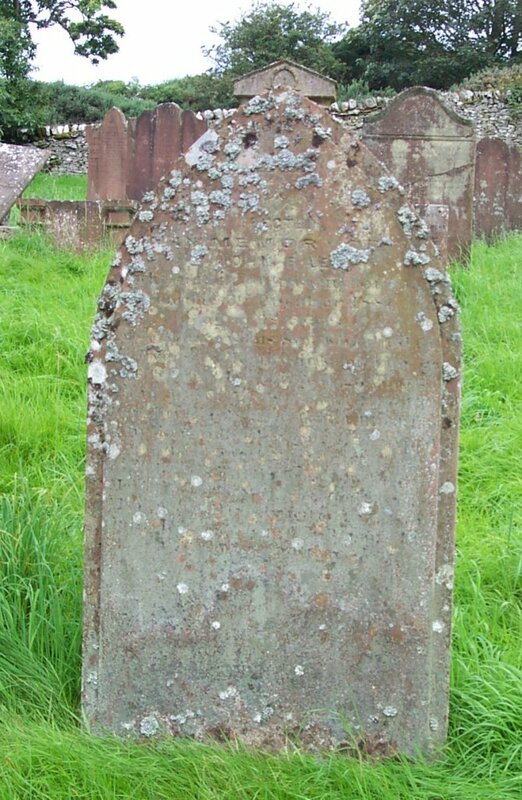 Also James, his son, who died 13th August 1827, aged 19 years. Also Elizabeth, his daughter, who died in Edinburgh, 31st October 1837, aged 32 years. Mary Corrie, his spouse, died 2nd April 1838, aged 63 years. Margaret, their daughter, who died 3rd February 1846, aged 32 years. Agnes, their daughter, died 2 3rd May 1851, aged 55 years. Thomas, their son, died 6th June 1863, aged 66 years. Mary, their daughter, who died at Lennox Plunton, 21st May 1880 aged 81 years. 21 (Front) In memory of Hugh Sproat, who died in Lennox Plunton, 2nd June 1847, aged 45 years. Also David, his son, who died 16th May 1853, aged 16 years. And Hugh, his son, merchant in London, who died at Lennox Plunton, 14th March 1878, aged 43 years. 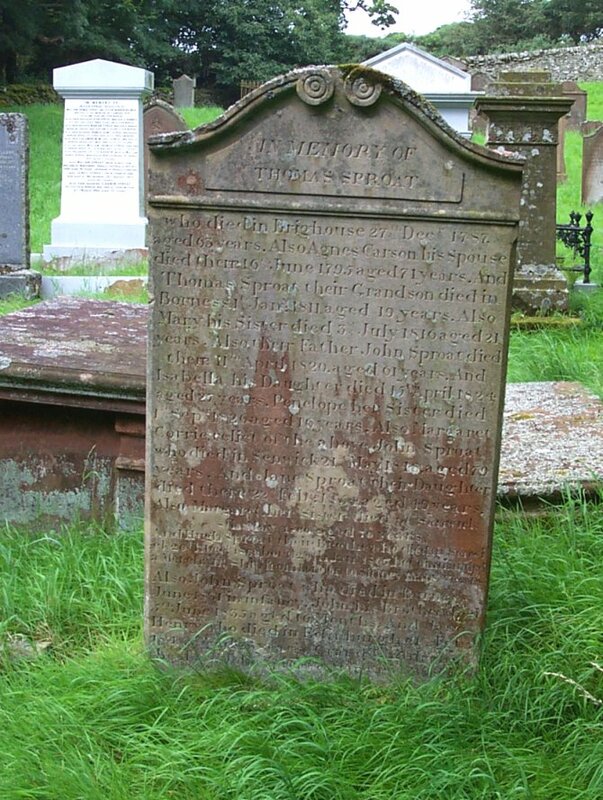 Mary MacMillan, wife of Hugh Sproat of Lennox Plunton, born at Viewfield, New Galloway, 11th December 1810, died 6th September 1887. 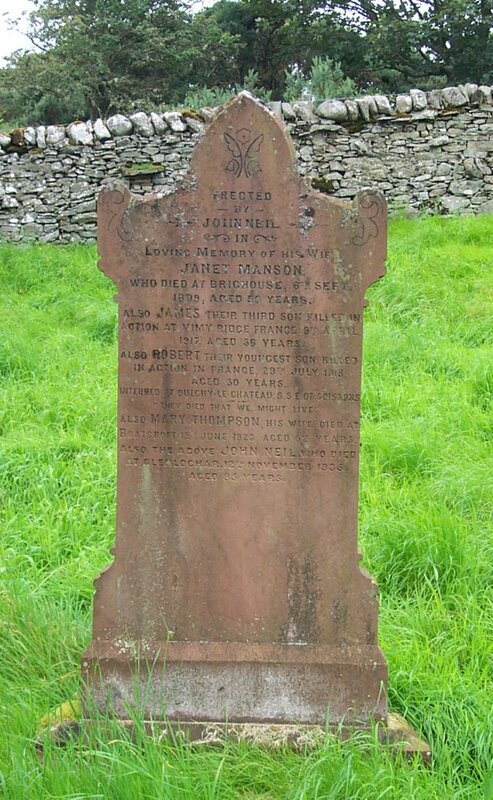 John, their son, died at Rainton, Girthon, 17th December 1887, aged 45 years. James McMillan Sproat, their grandson, and son of Robert Sproat, Lennox Plunton, who died 30th Jan, 1886, aged 11 months. (Rear) Elizabeth MacMillan, wife of Robert Sproat, late in Lennox Plunton, died 1 2th April 1908, aged 54 years, interred at Boise Cemetery, Idaho. And the above Robert Sproat, who died at Idaho on 26th March 1923, aged 78 years. 22 In loving memory of Kathleen Eleanor Margaret - Kim - beloved daughter of Thomas Alexander and Kathleen Sproat, Brighouse, who died 3rd Jan. 1960, aged 1 year and 3 months. 23 In memory of Margaret J McClelland, wife of Thomas A Sproat, who died at Brighouse, 21st October 1934, aged 34 years. Also the above Thomas A Sproat, who died 12th March 1946, aged 51 years. 24 In memory of Agness Sproat, who died at Graplin, 29th Sept. 1830, aged 74 years. 25 (East) To the memory of John Sproat, M.D. third son of the late Thomas Sproat, Brighouse, having practiced his profession for many years in Melbourne, Australia, he returned to his native parish and died on the 28th August 1856, aged 52 years, Also Eleanor May Sproat, eldest daughter of the late Alexander Sproat, Brighouse, who died 13th April 1918, aged 85 years. Also Elizabeth M.R. Sproat, daughter of Alex'r Sproat, Brighouse, who died 26th Aug. 1929, aged 77 years. (North) Sacred to the memory of James Hutton Thomson, only child of the late Rev’d Maitland Thomson, minister of the Parish of Aberdalgie, in the county of Perth, and of Elizabeth Thomson, his spouse, youngest daughter of late Thomas Sproat, farmer in Brighouse , he departed this life at Rockville, on the 30th day of June 1858, in the thirtenth (sic) year of his age. Much loved - much mourned. "Weep not, it is the Lord, let Him do what seemeth to him." (South). 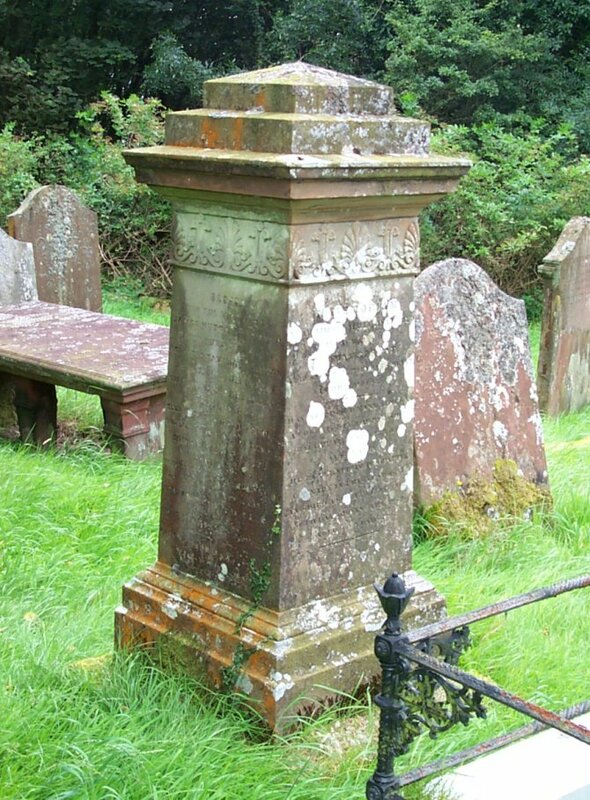 In memory of Elizabeth, youngest daughter of the late Thomas Sproat in Brig house, and widow of the Rev’d Maitland Thomson of Aberdalgy, Perthshire, died at Gatehouse, 7th March 1862, aged 52 years. Also Alexander Sproat, their second son, who died at London, 17th June 1877, aged 77 years. Also his sons, Thomas Alexander Sproat, who died 1st November 1911, aged 80 years. And Gilbert Malcolm Sproat, who died at Victoria, British Columbia, 4th June 1913, aged 79 years. (West) In memoriam. Near this place lie interred the remains of Thomas Sproat, eldest son of Thomas Sproat at Brighouse, having passed many years as a colonist in the parish of Ballarine, near Geelong, Australia, he returned to his native country in the year 1855, and died at Moffat, on the 30th day of January 1859, aged 60 years. 26 In memory of Alexander Sproat, who died at Boreland of Borgue, 2nd November 1860, aged 58 years. 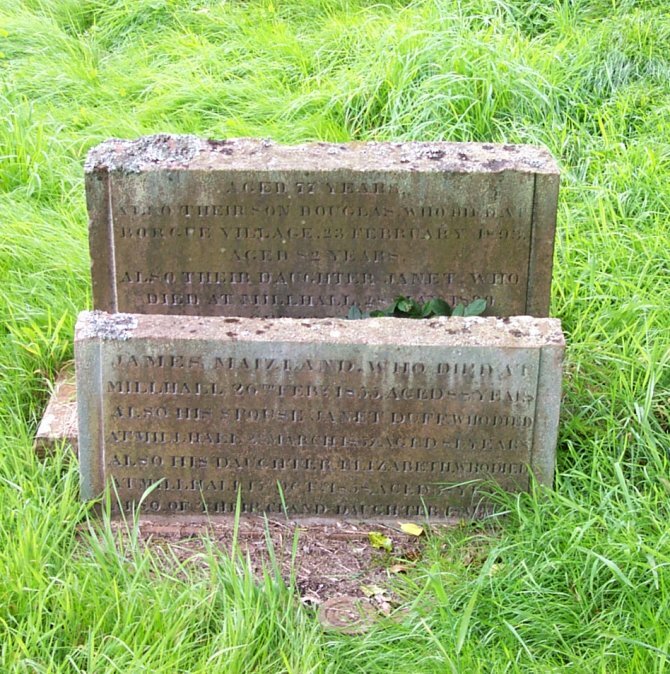 His daughter Mary, died at Gatehouse of Fleet, 17th May 1842, aged 2 years and 6 months. His son John, died at Gatehouse of Fleet, 10th March 1844, aged 2 years and 6 months. His daughter Mary, died at Auchengassel, 11th June 1866, aged 18 years. His daughter Jane, wife of Geo. F. Bowen, died at Trinidad, 27th November 1885, aged 42 years. Also Jane Carson, his wife, died at Auchengassel, 25th May 1888, aged 78 years. 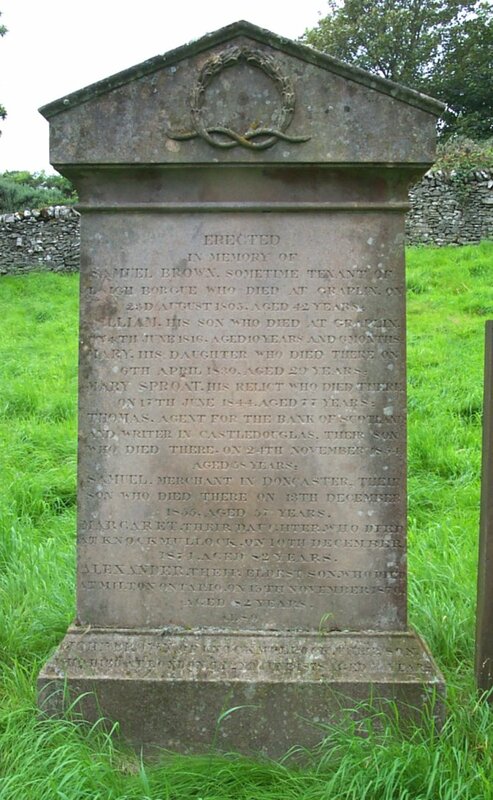 27 In memory of John Sproat, in Conchieton, who died 23rd Sept'r 1829, aged 63 years. 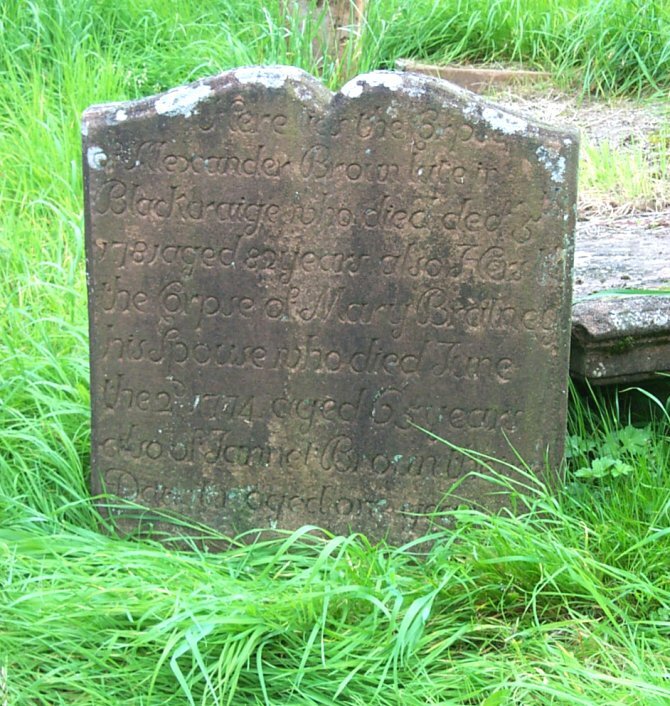 Also of his children: Alexander Sproat, died 26th July 1801, aged 7 months. Samuel Sproat, died 31st Oct. 1804, aged 9 months. Margaret Sproat, died 22nd Feb. 1824, aged 19 years. 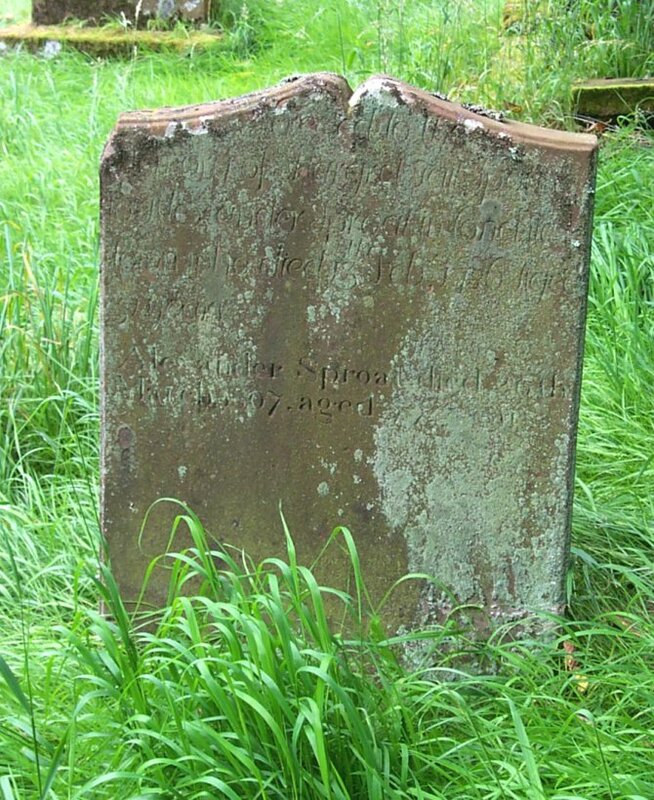 Samuel Sproat, died 25th Oct'r 1825, aged 10 years. Isabell Sproat, died 23rd Aug't 1829, aged 21 years. Also Isabella Thomson, spouse of the above John Sproat, who died at Ingleton of Kelton, 3rd March 1862, aged 88 years. In memory of Mary Sproat, born at Conchieton 3rd Oct. 1807, died at Fleet St., Gatehouse, 6th Dec. 1884, aged 77 years. John Sproat, his son, died at Gatehouse, 19th July 1890, aged 80 years. 28 In memory of Margaret Corrie Sproat, daughter of William Sproat and Jane McGill, who died at Borness, 3d December 1858, aged 23 years. Also Jane Penelope, her sister, who died at Torquay, South Devonshire, 19th February 1860, aged 19 years. The above William Sproat, who died at Borness, November 13th 1870, aged 71 years. Also two sons who died in infancy, John, June 1831 & John, June 5th 1835. 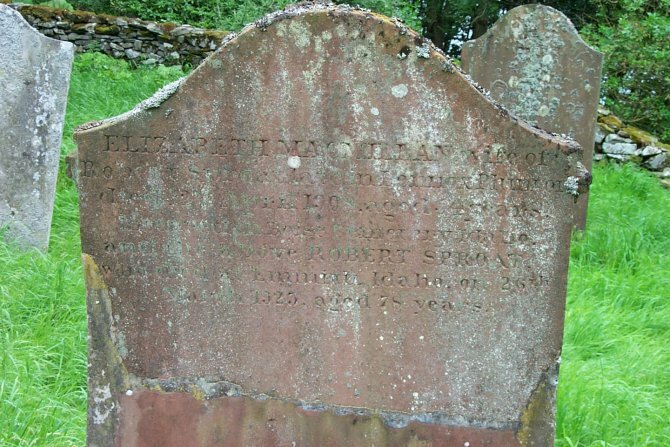 Also the above Jane McGill, relict of the above William Sproat, who died at Kirkcudbright, 4th Feb. 1892, aged 84 years. 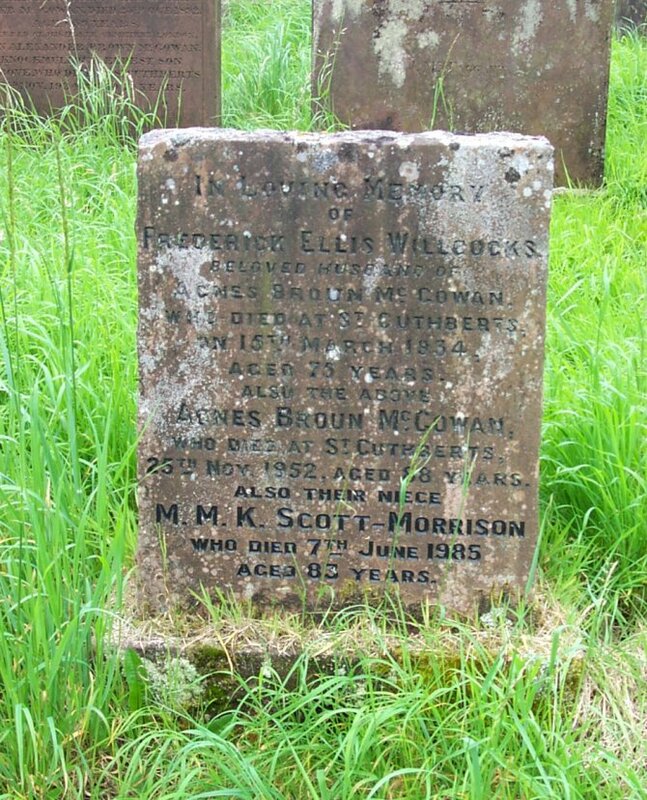 Also their daughters, Isabella Brown Sproat, who died at Kirkcudbright, 21st April 1899, aged 56 years, and Elizabeth Messenger Sproat, who died at Kirkcudbright, 12th April 1915, aged 77 years. And Agnes Eleanor Sproat, wife of W O D Welsh, who died at Parkstone, Dorset, 1st Dec. 1919, aged 75 years, and there was buried. Also Jessie, their daughter, wife of C J Clover, who died at Birkenhead, 25th February 1930, aged 81 years, and was there buried. 29 In memory of Jessie Sproat, daughter of William Thomas Sproat and Jessie Barber, his wife, who died at Balmangan, 28th January 1879, aged one year and four months. Also their daughter Jean Sproat, who died at Borness, 15th July 1883, aged three years and eleven months. Also their daughter Marion Sproat, who died at Borgue House, 26th August 1883, aged one year and eleven months. Also their daughter Frances Agnes Sproat, who died at Borgue House, 3rd April 1885, aged three months. Also their son Andrew McGill Sproat, who died at Borgue House, 20th May 1900, aged 25 years. Also the above William Thomas Sproat, who died at Borgue House, 18th October 1923, aged 77 years. Also the above Jessie Barber, wife of William Thomas Sproat, who died at Borgue House, 15th April 1931, aged 77 years. 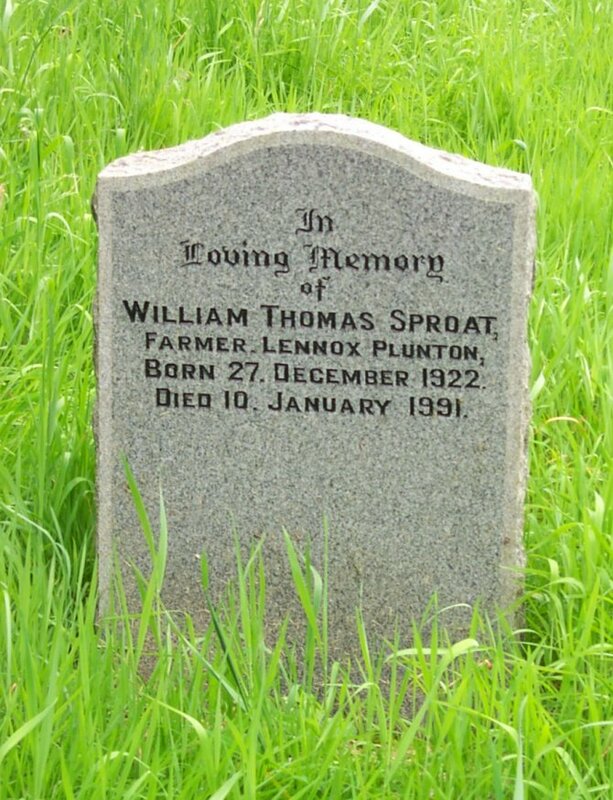 Also William Sproat, their their eldest son, who died at Banyenong, Donald, Australia, 16th Oct. 1948, aged 74 years, interred in Donald Cemetery. And James Sproat, their fourth son, who died at Melbourne, 26th August 1953, aged 65 years. Also their daughter Eleanor Sproat, Ivy Cottage, Borgue, who died at Darlington, 27th March 1962, aged 72 years. 30 In memory of John Barber Sproat, 'Duncroft', Twynholm, late in Lennox Plunton, born at Balmangan, Borgue, 3rd April 1876, died 3rd October 1959. 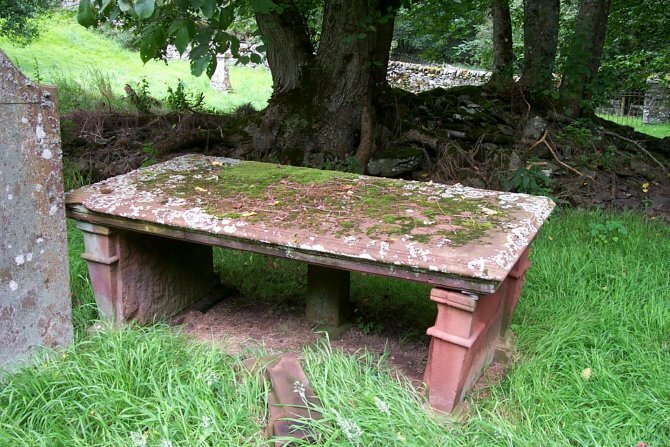 Also Elizabeth Reid Kirkwood, his wife, born at Drumbuie, Beith, 7th July 1884, died at 'Duncroft', 14th June 1962. 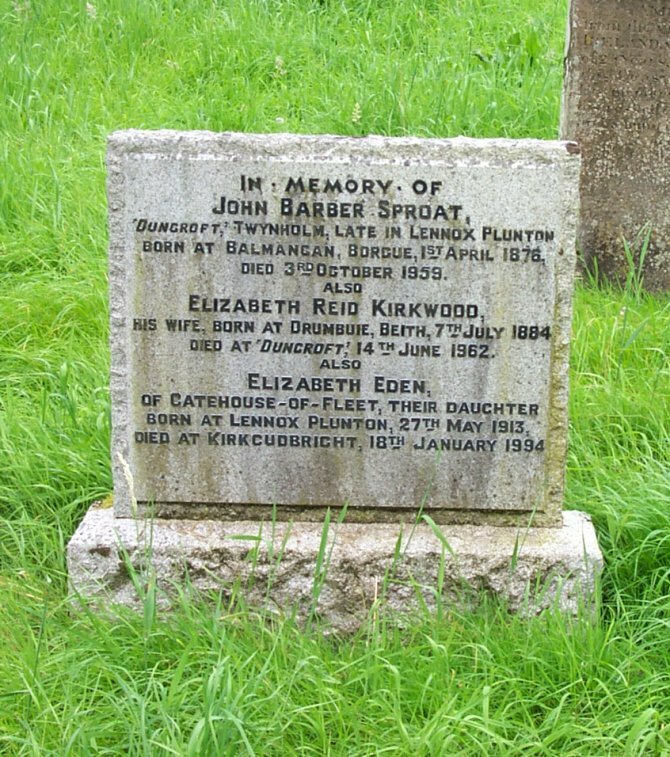 Also Elizabeth Eden of Gatehouse of Fleet, their daughter, born at Lennox Plunton, 27th May 1913, died at Kirkcudbright, 18th January 1994. 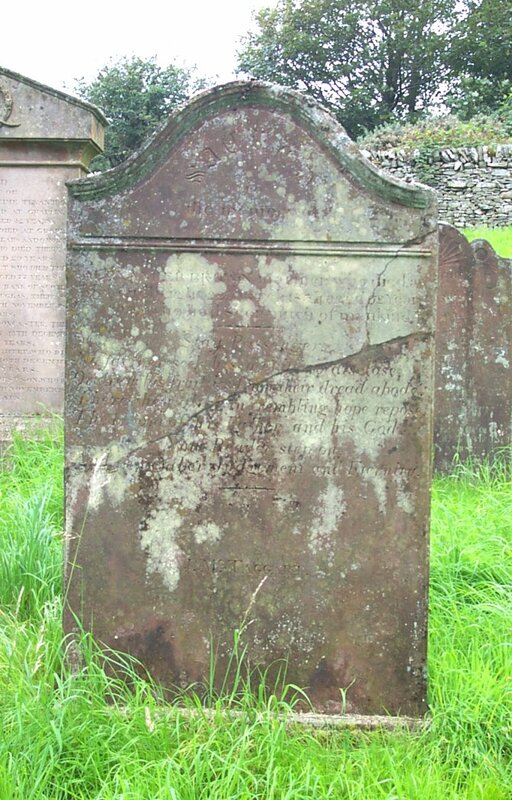 32 In memory of Mr Richard Hardacre, of Whitehaven, mariner, died Oct’r 27th 1764, aged 29 years. 32a In loving memory of William Thomas Sproat, farmer, Lennox Plunton, born 27 December 1922, died 10 January 1991. 34 Erected in kind remembrance of Andrew Gilmour from the vicinity of Magherafelt, Ireland, who was cut off at the age of 24 years, being shipwrecked on this coast 20th November 1830. His memory will be long dear to his distressed and affectionate parents, and a numerous circle of friends and acquaintances. "Oh death, where is thy sting; Oh grave, where is thy victory." 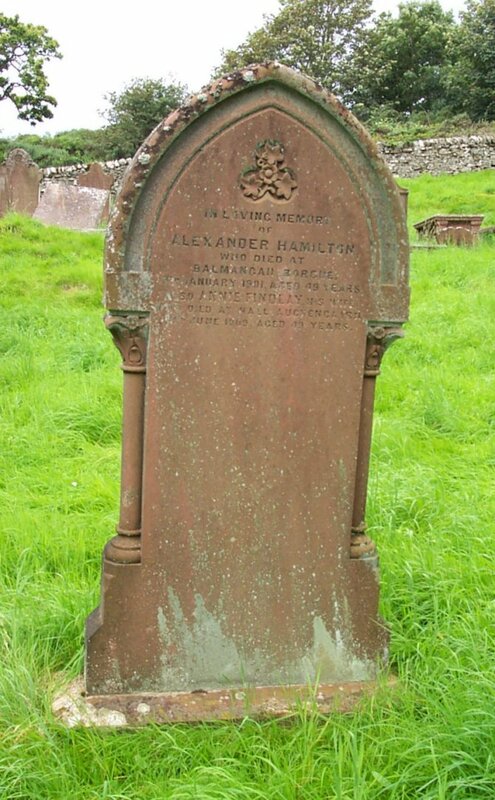 35 In loving memory of Alexander Hamilton, who died at Balmangan, Borgue, 9th January 1901, aged 49 years. Also Annie Findlay, his wife, who died at Hall, Auchencairn, 12th June 1909, aged 49 years. 36 In memory of John McMinn, who died 14 June 1761, aged 87 years. 37 Erected by Margaret Watson, in memory of her husband Robert Watson, lightkeeper at Little Ross, who was drowned 5th April 1864, aged 35 years. And their son William R. Watson, who died 11th June 1863, aged 10 months. 38 In memory of John Robertson, son of Thomas Robertson, who died the 21st Oct’r 1855, aged 5 years. Also of Robert, who died 30th Oct’r 1855, aged 9 years. Also of Jane, his daughter, who died 7th March 1867, aged 16 years. 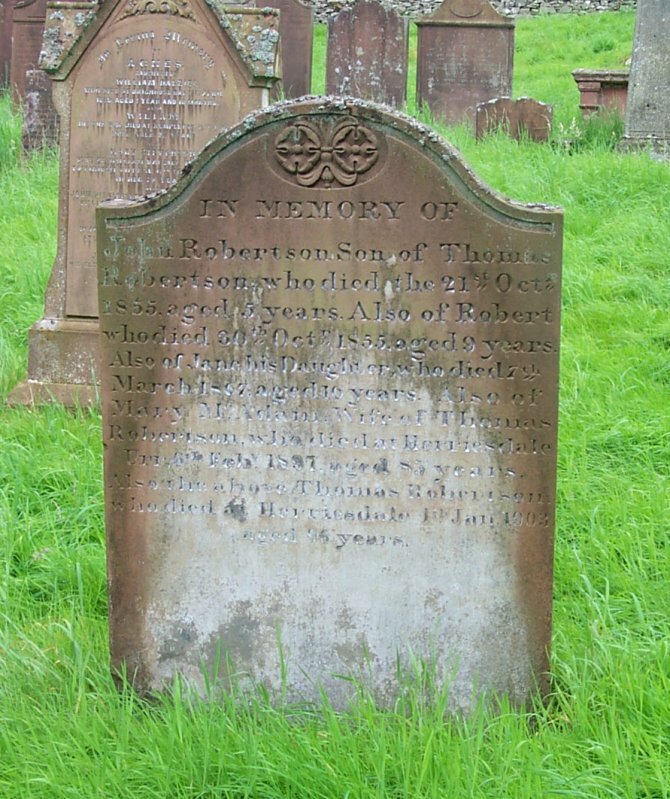 Also of Mary McAdam, wife of Thomas Robertson, who died at Herriesdale, Urr, 6th Feb’y 1897, aged 85 years. Also the above Thomas Robertson, who died at Herriesdale, 4th Jan. 1903, aged 96 years. 39 In loving memory of Agnes, daughter of William Dalziel, who died at Brighouse Bay, 13th April 1879, aged 1 year and 10 months. Also William, his son, who died at Kempleton, 15th June 1895, aged 22 years. Also Mary Stevenson, wife of William Dalziel, who died at Twynholm Village, 17th February 1917, in her 76th year. Also John, his eldest son, who died at Twynholm Village, 22nd Feb. 1921, aged 50 years. 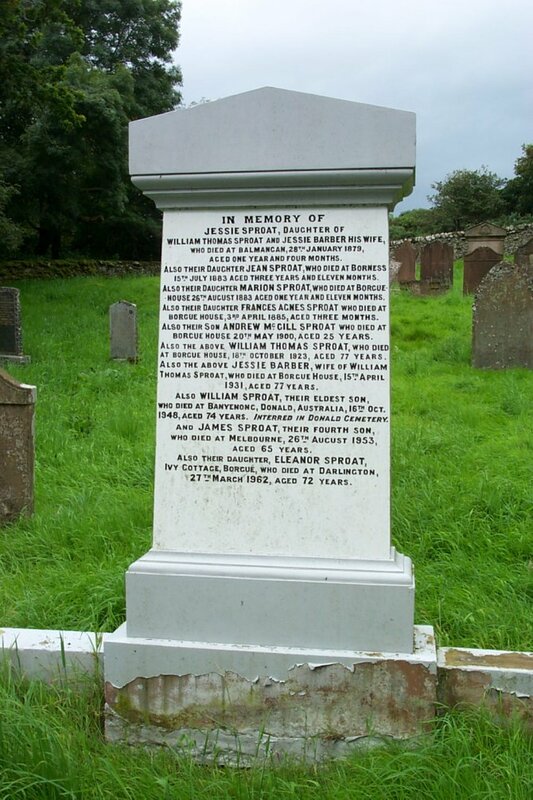 Also the above William Dalziel, who died at Twyholm Village, 30th March 1928, aged 82 years. Also Jane Robertson Dalziel, his elder daughter, who died 10th April 1956 aged 85 years. 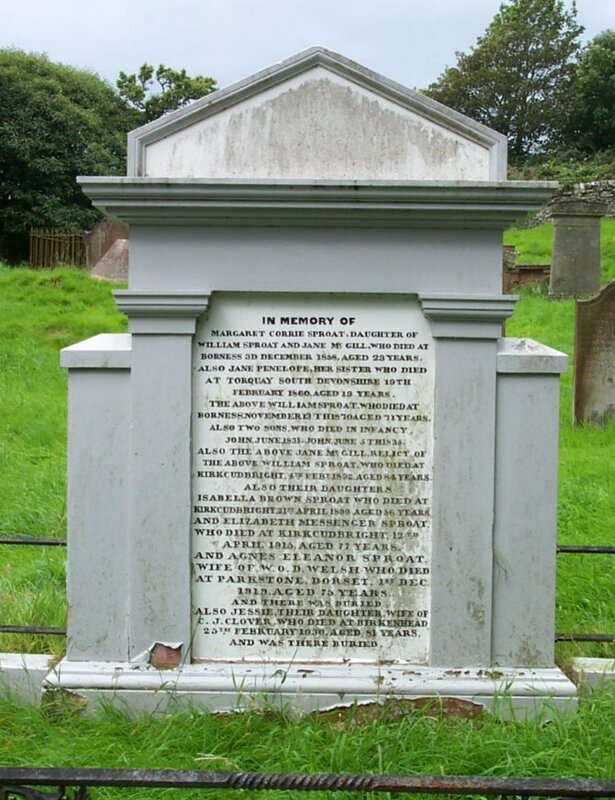 40 Erected in memory of John Rae who died at Culraven, Borgue, on the 3rd October 1881, aged 48 years. Also Andrew, his son, who died at Overlaw, Rerrwick, on the 16th June 1886, aged 23 years. Also Janet Livingstone Rae, his daughter, and wife of Joseph Blackley, who died at Low Borgue, on 23rd April 1889, aged 29 years. Also James Rae, his son, who died at Motherwell, 15th Oct. 1893, aged 23 years. Also Fanny Handly, wife of the said John Rae, who died at Borgue, 13th June 1900, aged 65 years. 41 Erected by William Thomson, in loving memory of his wife Samina Jamieson, died at Couper Croft, 6th June 1944, aged 73 years. Their son Andrew Hyslop Jamieson, died 29th Oct 1911, aged 5 years. 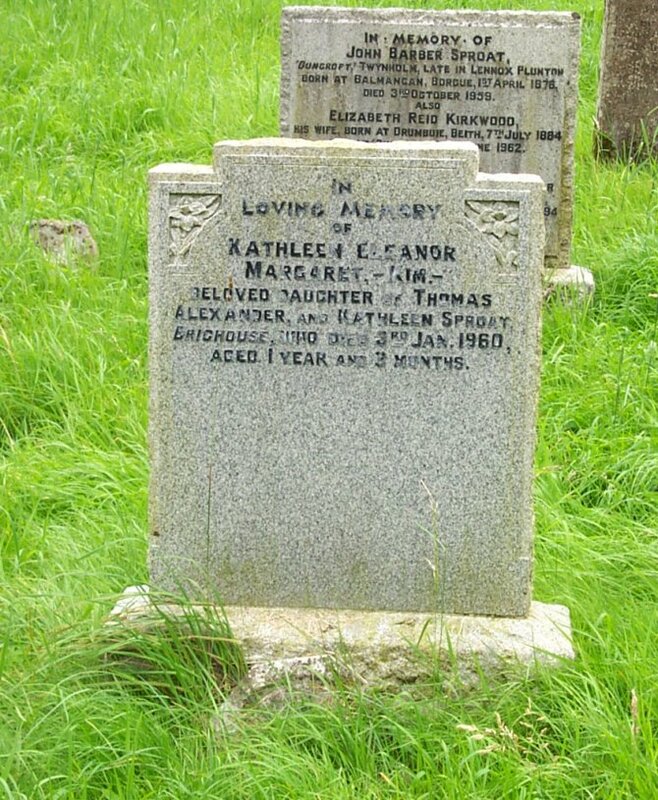 Their daughter Sarah, died 24th Dec 1929, aged 27 years. 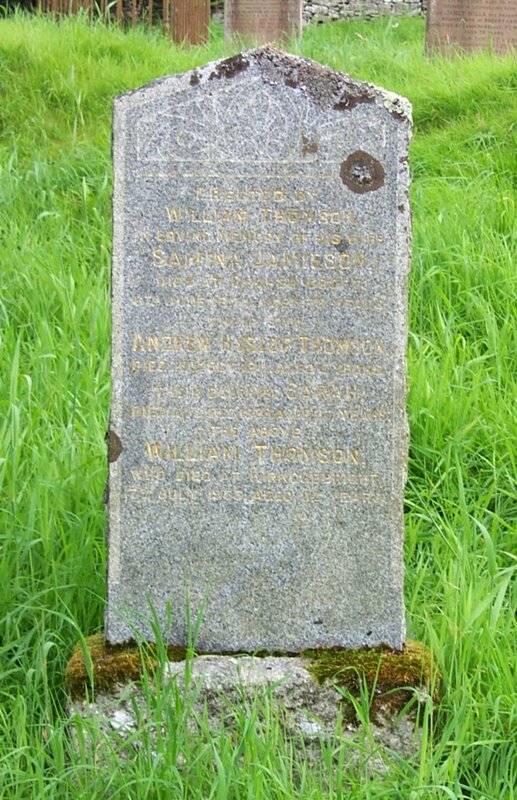 The above William Thomson, who died at Kirkcudbright, 17th July 1955, aged 82 years. 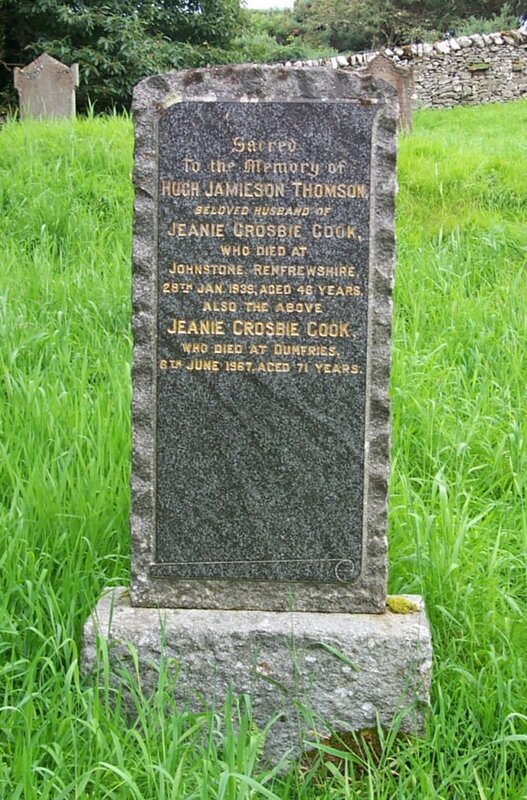 42 Sacred to the memory of Hugh Jamieson Thomson, beloved husband of Jeanie Crosbie Cook, who died at Johnstone, Renfrewshire, 28th Jan 1939, aged 46 years. Also the above Jeanie Crosbie Cook, who died at Dumfries, 6th June 1967, aged 71 years. 43 In memory of Isabella MacGowan, daughter of John MacGowan and Agnes Brown, his wife, who died at Senwick on the 23rd day of June 1898, aged 78 years. Also the sons and daughters of Alexander McGowan, their son. Mary Isabella McGowan, died in Canada, 1898, George McGowan, died in Canada, 1938, Martha McNeill, died in London, 1937, Catherine Scott Morrison, died in Walberswick, 1937, Margaret Brown Fitzgerald, died in Liverpool, 1939. William Brown McGowan, died in Milnthorpe, 1952. 44 Erected by Alex’r McGowan, in memory of his mother Agnes Brown, who died at Pennymuir, 2d March 1843, aged 53 years. Also his father John McGowan, who died at Senwick, 16th Nov’r 1854, aged 70 years. 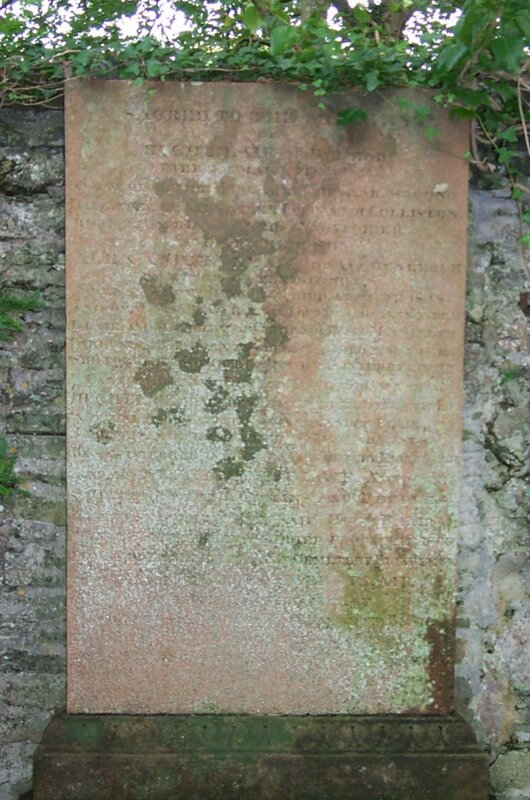 Also Alexander McGowan, son of the above, who died at St Cuthberts, Kirkcudbright, 31st May 1910, aged 86 years. Also Martha Mills, wife of Alexander McGowan, died 25th Oct. 1892, aged 59 years, interred at Highgate Cemetery, London. John Alexander Brown McGowan, of Knockmullock, eldest son of above, who died at St Cuthberts, 23rd Nov 1934, aged 75 years. 45 Sacred to the memory of Alexander Brown, mariner, who died 22nd March 1834, aged 52 years. A man who had seen much of mankind. Stay passenger. No farther seek his merit to disclose, or draw his frailties from their dread abode, there they alike in trembling hope repose, the bosom of his father and his God. Now reader step on, and remember judgement and eternity. J McTaggart. 46 In loving memory of Frederick Ellis Willcocks, beloved husband of Agnes Broun McGowan, who died at St Cuthberts on 15th March 1934, aged 75 years. Also the above Agnes Broun McGowan, who died at St Cuthberts, 25th Nov. 1952, aged 88 years. Also their niece M.M.K. Scott-Morrison, who died 7th June 1985, aged 83 years. 47 In memory of Alexander Brown, who died Ingleston, 26th July 1806, aged 69 years. 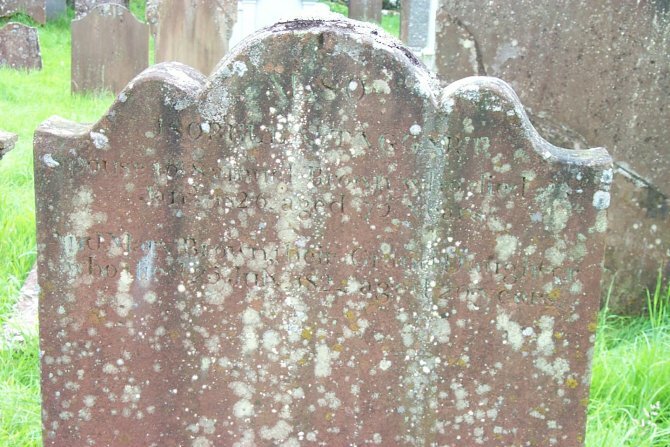 Also of his two sons, Samuel, who died in Jamaica, 3rd June 1803, aged 24 years, and John, who died at Barharrow, 26th Feb’y 1815, aged 28 years. 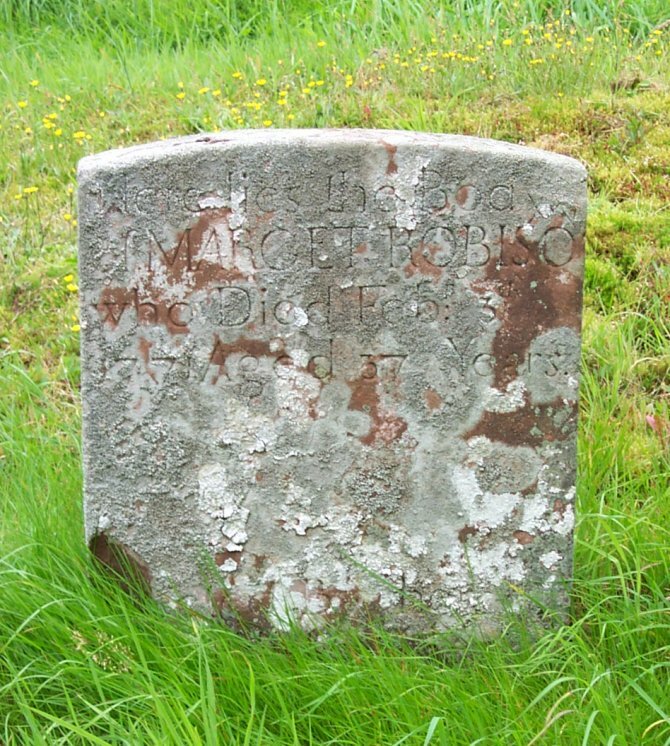 And also of Agnes McGuffog, his spouse, who died at Little Carleton, the 25th April 1828, aged 76 years. And also Tho’s Brown, late tennant in Carleton, who died 18th April 1944, in the sixty seventh year of his age, son of the above Alex. Brown & Agnes McGuffog. 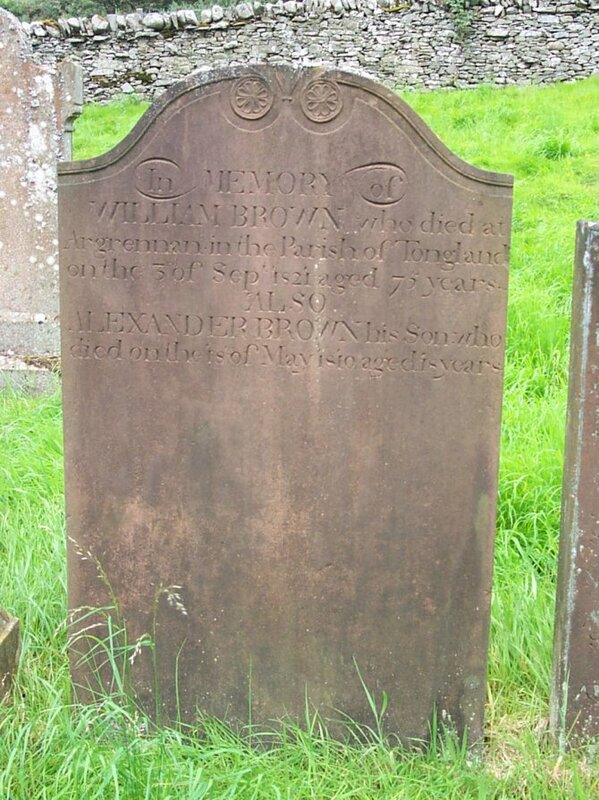 48 Here lyes the corpse of Alexander Brown, late in Blackcraige who died Dec’r 5th 1781, aged 82 years. Also here lies the corpse of Mary Bratney, his spouse, who died June the 2nd 1774, aged 65 years. Also of Janet Broun, their daughter aged one year. 49a Here lys the corps of Alexander Broun, who died in the 75th year of his age, the 21 day of June 1725. 49b In loving memory of Samuel Brown, Barmagachan, who died 21st April 1830, aged 79 years. And Janet Henry, his wife, who died 4th January 1845, aged 86 years. 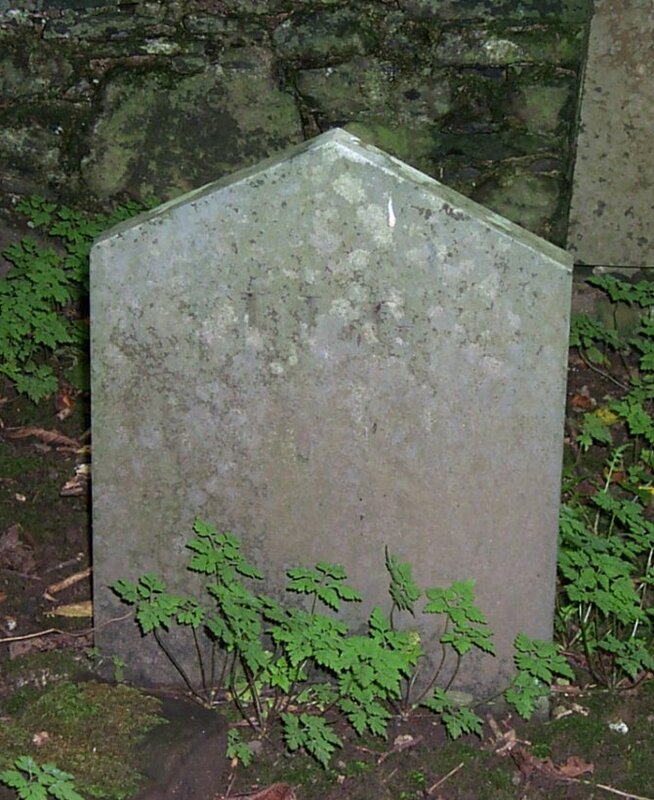 Also of their sons and daughters, Alexander and Agnes, who died in infancy, Janet, who died 8th April 1817, aged 19 years, John, who died in Jamaica, 14th Feb’y 1821, aged 45 years, Samuel, sometime in Barmagachan, who died 16th December 1851, aged 58 years. Janet Milroy, eldest daughter of Anthony Milroy and Mary Brown, born 28th May 1822, died 18th April 1887. Also their sons and daughter, Samuel, born 1825, died in Glasgow, Dec’r 1892, Nathan, born 1827, died in London, Ontario, Feb 1890, Agnes Affleck, born 1831, died at Harrogate 1907. 49c In loving memory of Anthony Milroy, late in Disdow, who died at Little Boreland, Anwoth, 12th May 1855, aged 76 years. And of his sons and daughters; Anne, who died 23rd April 1830, aged 1 year. 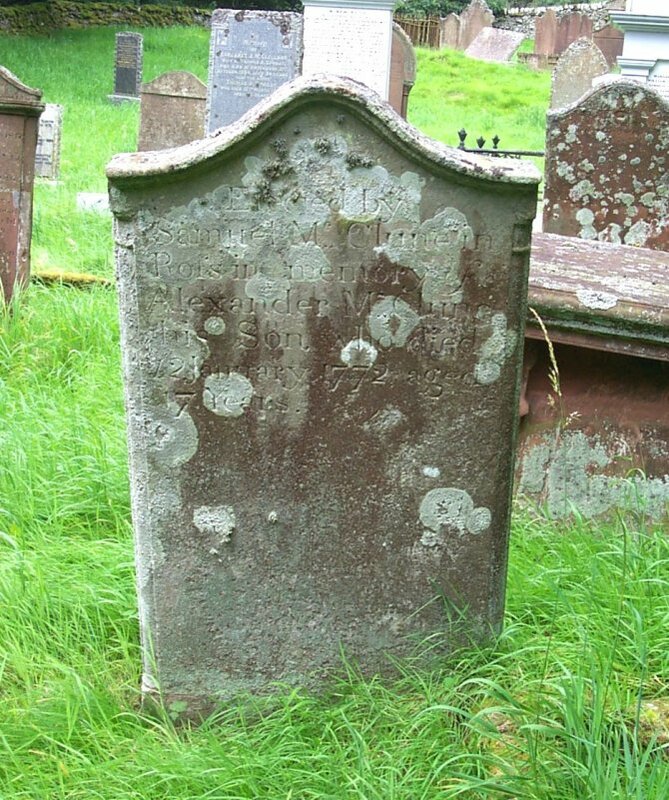 Mary Anne, who died 21st February 1833, aged 2 months. Margaret, who died at Edinburgh, 22nd Feb 1849, aged 24 years, and was interred in the Dean Cemetery. 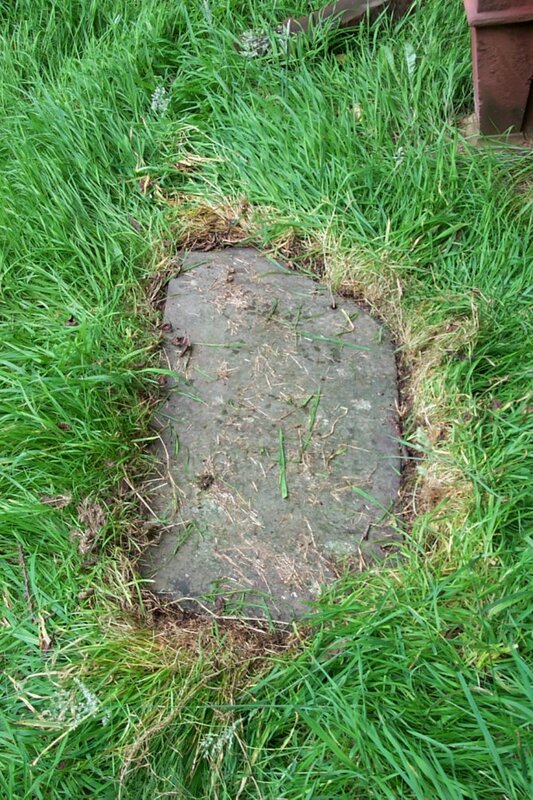 John, who died in Australia, 11th Feb 1852, aged 31 years. Mary Anne, who died 26th May 1866, aged 27 years. Anthony, who died 8th Dec 1878, aged 39 years. 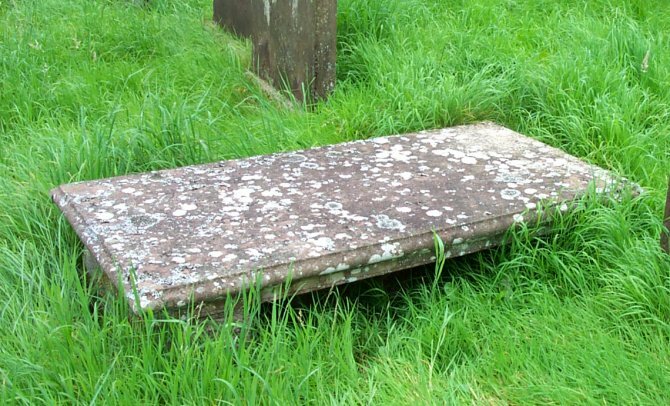 Elizabeth, who died 14th Sep 1883, aged 49 years. Also of Mary Brown, spouse of Anthony Milroy, who died 4th Nov 1874, and 79 years. 50 Erected by William Patterson, London, in memory of his father Thomas Patterson, who died at (illegible font) 22nd Oct. 1821, aged 66 years. And his brother David, who died 12th Feb 1805, aged 12 years. Also in affectionate remembrance of his mother, Elizabeth Brown, who died 11th Feb’y 1827, aged 69 years. Also the said William Patterson, who died at London, 9th Nov 1831, aged 49 years. 51 (Front) In memory of James Maizland, who died at Millhall, 26th Feb’y 1855, aged 88 years. Also his spouse, Janet Duff, who died at Millhall, 2d March 1857, aged 84 years. 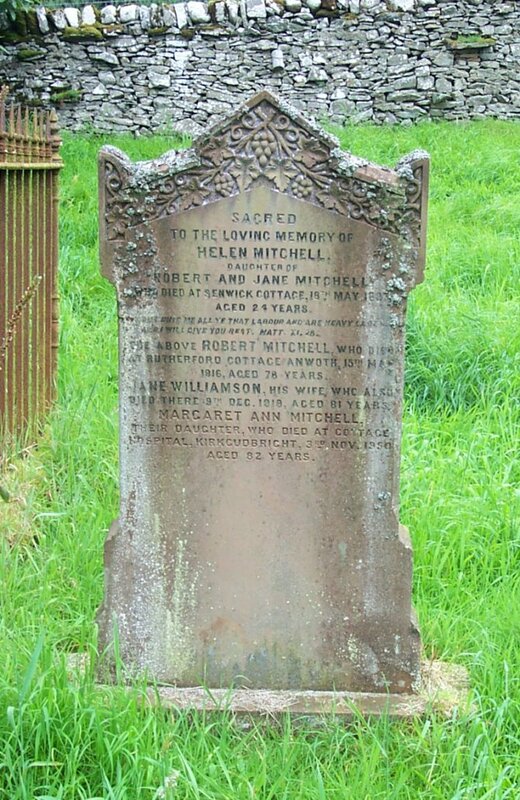 Also their daughter Elizabeth, who died at Millhall, 15th Oct’r 1858, aged 58 years. Also their grand-daughter Isabella Maizland, who died at Borgue Village, 31st May 1865, aged 6 years and 11 months. 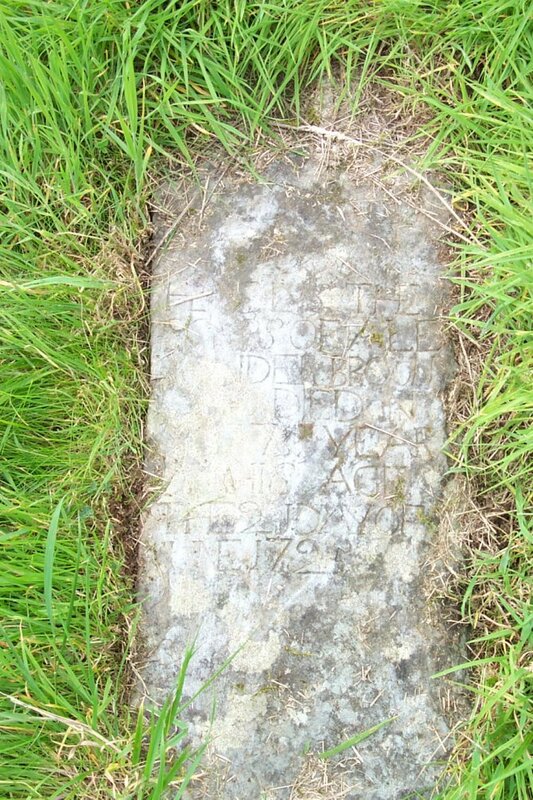 Also their daughter Isabella, who died at Millhall, 15th December 1885, aged 77 years. Also their son Douglas, who died at Borgue Village, 23rd February 1893, aged 82 years. Also their daughter Janet, who died at Millhall, 28 May 1899, aged 92 years. Also Grace McConnell, wife of the above Douglas Maitland, who died at Borgue Village, 28th Sep. 1910, aged 91 years. (Rear) Also of Janet Maizland, postmistress, Borgue, daughter of the said Douglas Maizland, who died 15th Nov. 1920, aged 61 years. 52 Erected by Robert McLellan, in loving memory of his only son Robert, who died at Burnfoot, Borgue, 14th May 1907, aged 40 years. Also the above Robert McLellan, who died 7th February 1913, aged 78 years. Also Elizabeth, his daughter, died 25th Feb’y 1921, aged 58 years. Also Mary Carson, his wife, who died 15th March 1921, in her 91st year. Aye fond remembrance of the McLellan family, by the McLeod family. 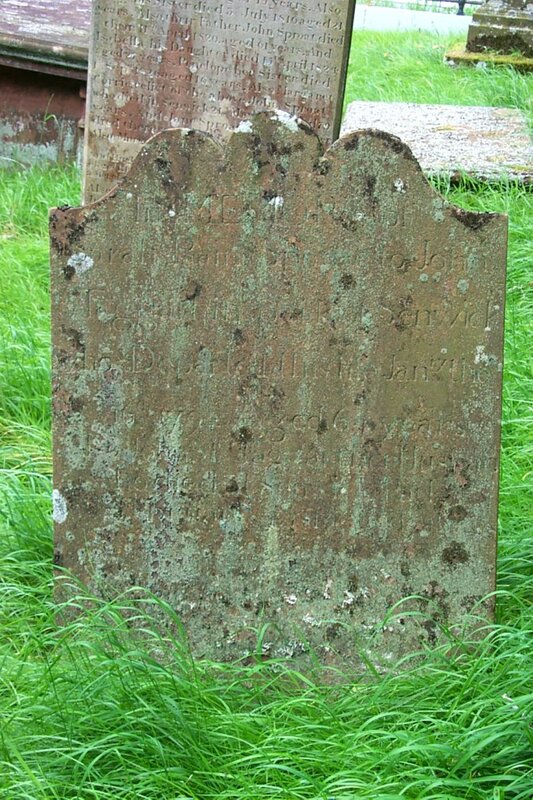 53 (Front) Here lies Mary Wilson, spouse to James Sharp in Ross, who died March 30th 1768, aged 66 years. Also Jean and Nicolas Sharps, their children. 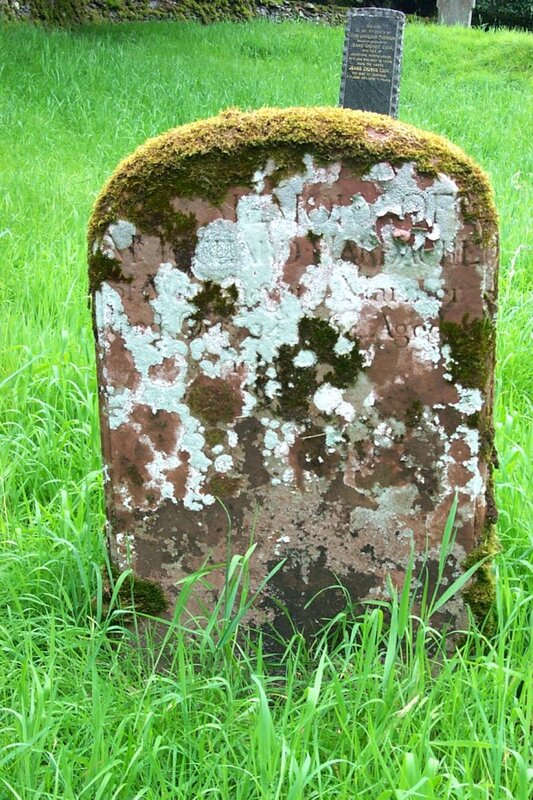 Also the above James Sharp, who died 12th March 1785, aged 77 years. (Rear) Also James Sharp, senior, who died at Senwick, 16th Nov’r 1818, aged 78 years. Also his wife Agnes Sproat, who died at Bridge-end, 8th Feb’y 1838, aged 76 years. 54 Erected by Marg’t Sharp, Senwick, in memory of her mother, Janett Gordon, who died 19th July 1804, aged 66 years. And of her father, Hugh Sharp, who died 14th Nov’r 1811, aged 72 years. 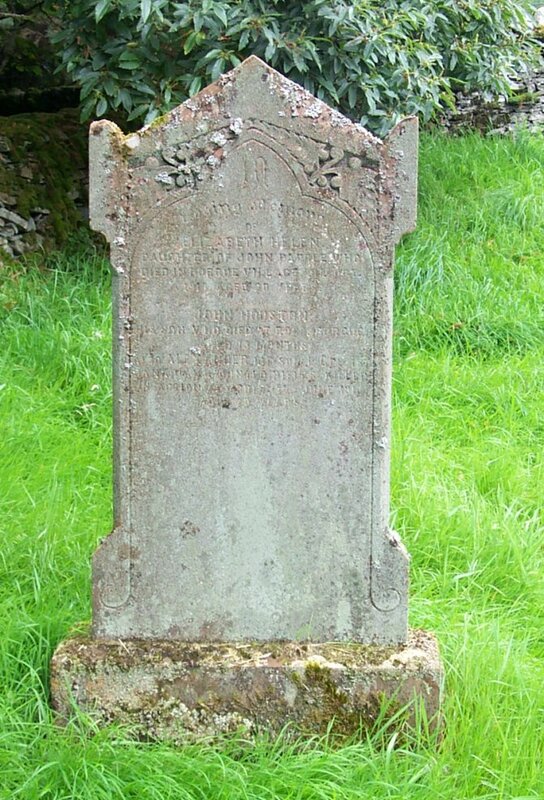 Also James McFegan, their grandson, who died 19th July 1821, aged 9 years. Hugh Milligan, their grandson, who died at Glasgow, 26th Oct. 1845, aged 41 years. The above Margaret Sharp, who died 15th June 1865, aged 75 years. 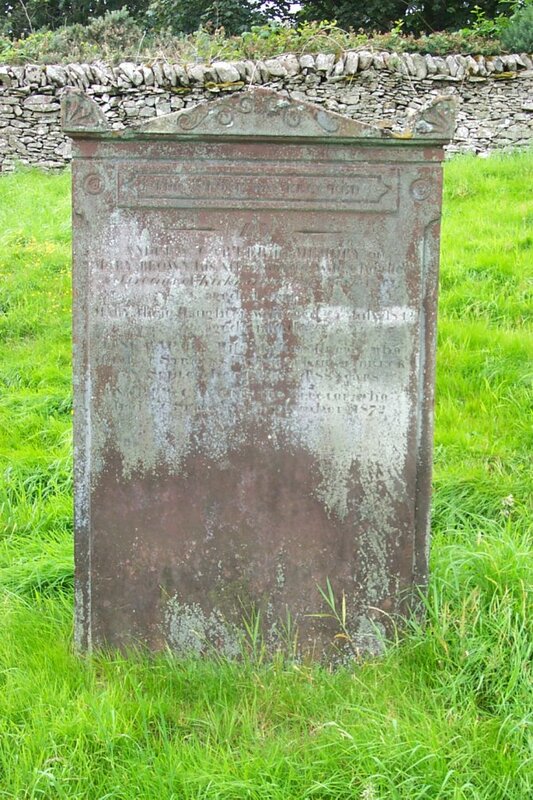 And James Sharp, his grandson, who died in Senwick, 22nd March 1806, aged 8 years. 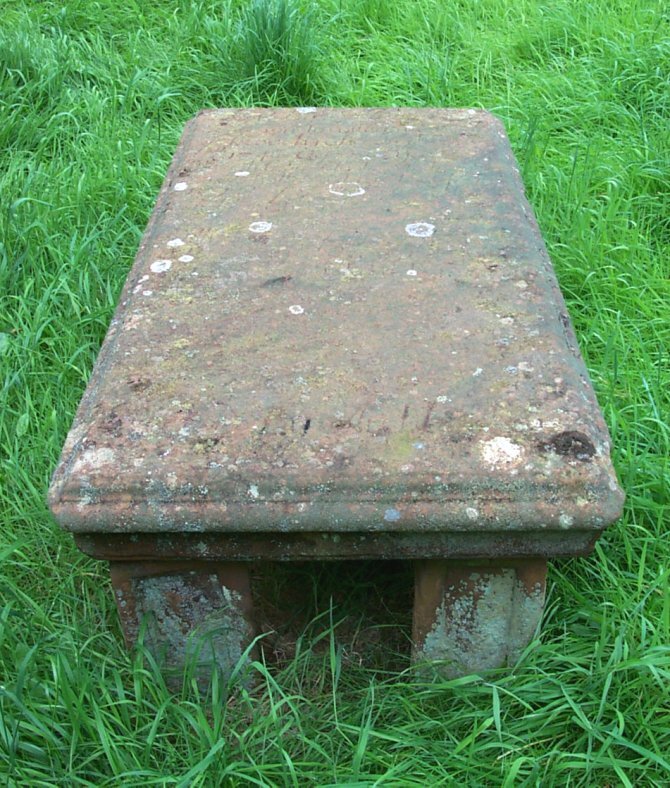 55 Here lies the body of Margret Robison, who died Feb 3rd 1771, aged 37 years. Erected by her husband Hugh Sharp. 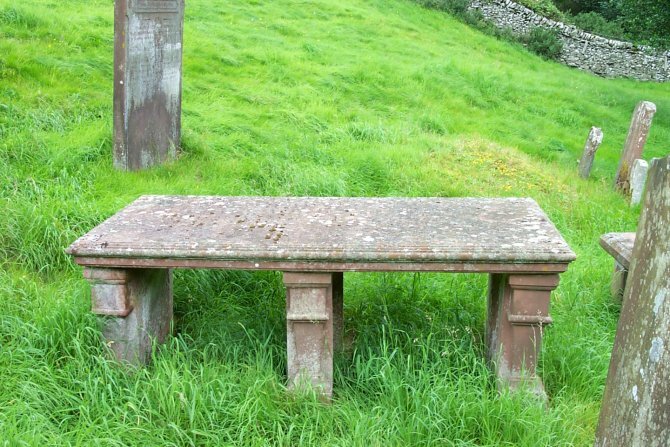 56 Erected by Alex’r & James Broun, in memory of John Broun, smith, late in Langlands of Newton, who died Jan’y 22nd 1743, aged 44 years. Also Mary Clark, his spouse, who died the 26th Dec’r 1760, aged 67 years. Also James Broun, their son, who died 20th April 1782, aged 59 years. Also Margaret Kitrick, his spouse who died 20th August 1799, in the 76 year of her age. 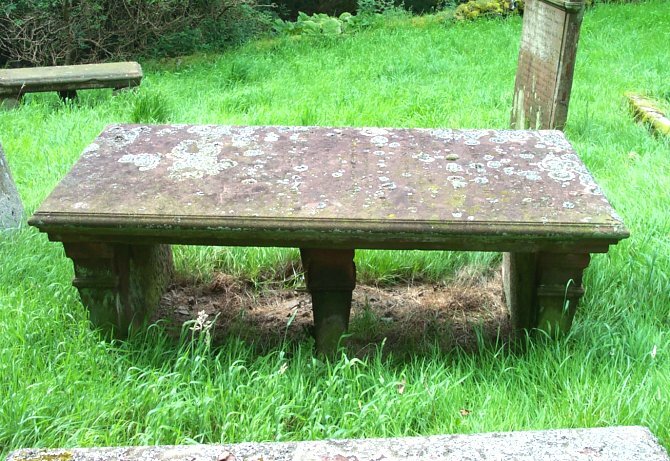 Also the remains of James Brown, late in Upper Chapelton, who died 16th March 1811, aged 60 years. 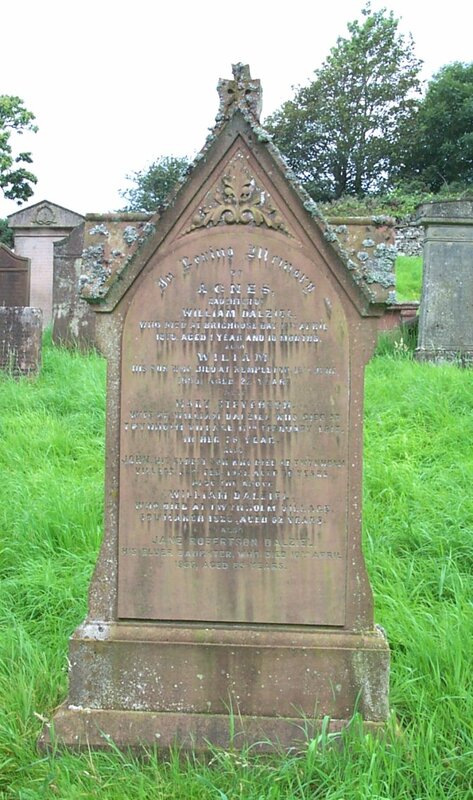 And Isabella Brown, his spouse, who died at Pennymuir, on the 14th day of January 1831, aged 74 years. 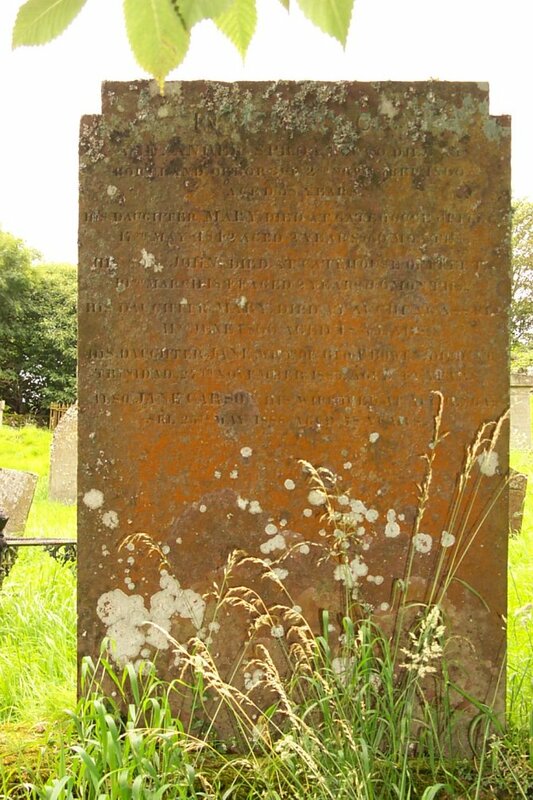 In memory of Samuel Brown, died at Chapelton Village, 9th Nov 1826, aged 63 years. 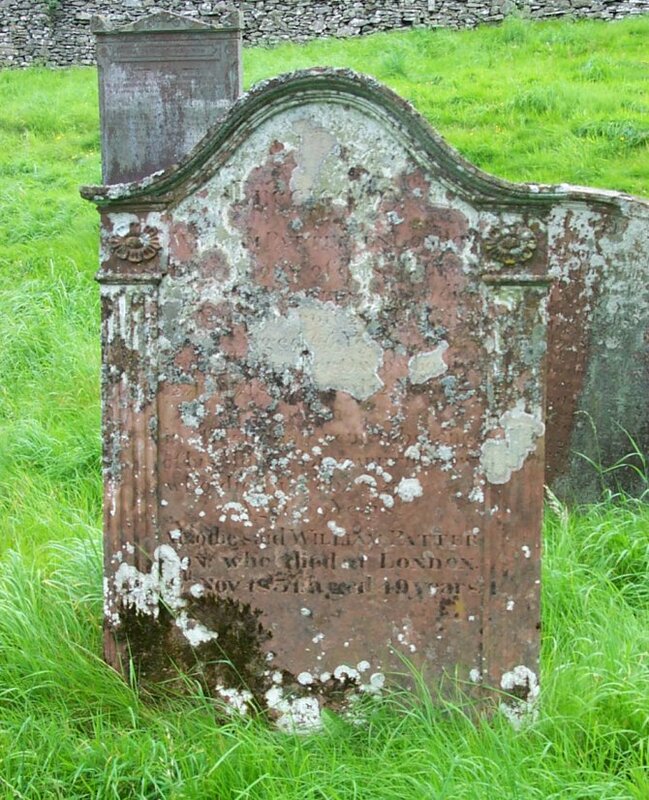 Mary Thomson, his spouse, died at Kirkcudbright, 22 July 1852, aged 91 years. 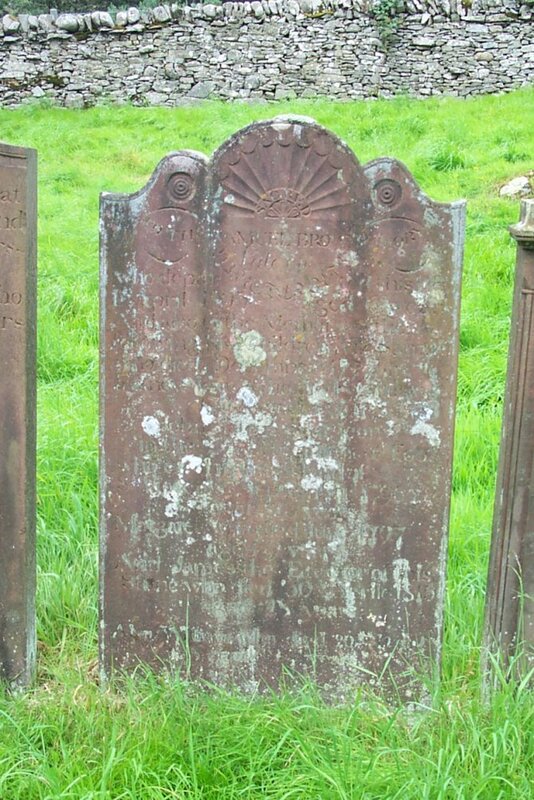 Also their children Samuel, died at Chapelton Village, 1st April 1822, aged 21 years. 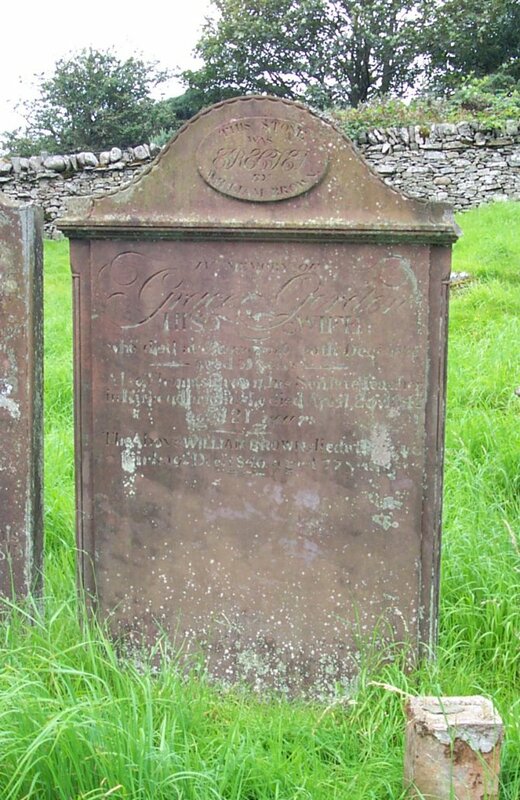 James, died in Jamaica, 12th July 1821, aged 37 years. 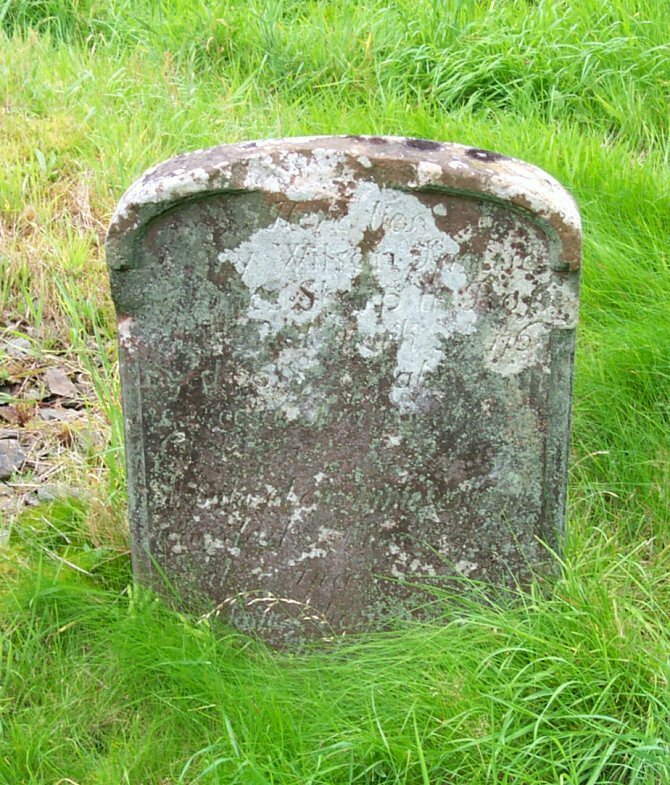 Mary, died at Chapelton Village, 30th Nov 1815, aged 51 years. 58 This stone was erected by William Brown, in memory of Grace Gordon, his wife, who died at Barncrosh, 20th Dec’r 1825, aged 35 years. 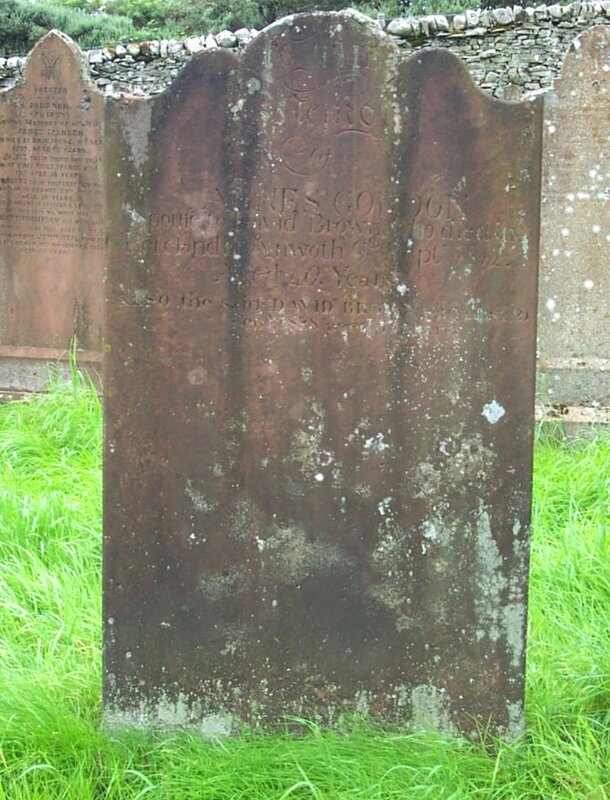 Also Thomas Brown, his son, late teacher in Kirkcudbright, who died April 25th 1842, aged 21 years. 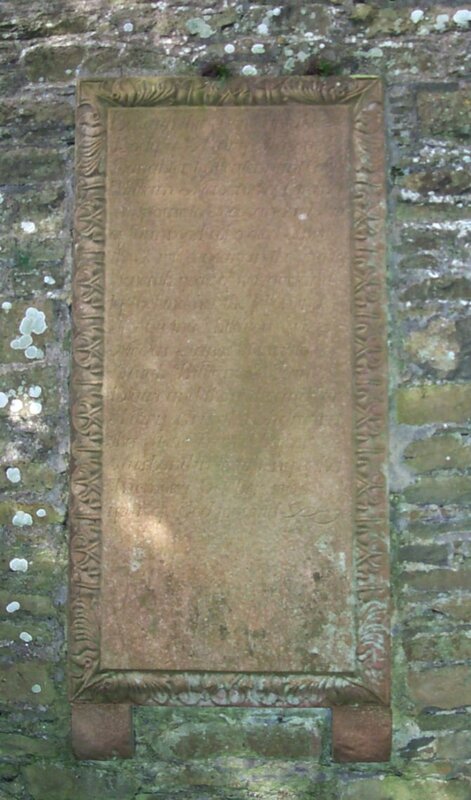 The above William Brown, died at Borgue Kirk, 19th Dec’r 1846, aged 77 years. 59 (Front) Sacred to the memory of Samuel Brown, late in (illegible), who departed this life 1st April 1805, aged 61 years. And also to the memory of the following his children, viz; Samuel who died December 1777, in infancy. Isaac, who died January 1792, aged 1 year. 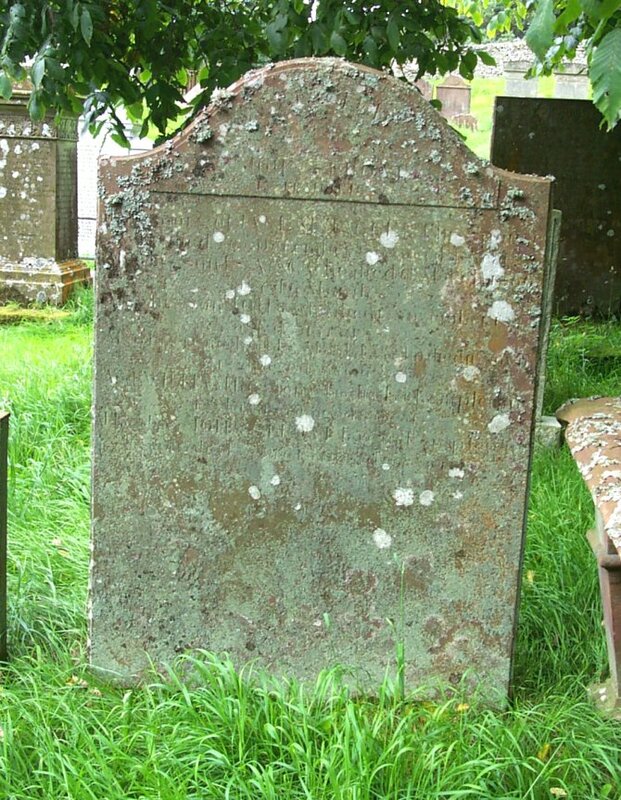 John, late a surgeon in the 42nd Regiment of Foot, who died in the Island of St Vincents, September 1796, aged 23 years. Margaret, who died June 1797, aged 9 years. 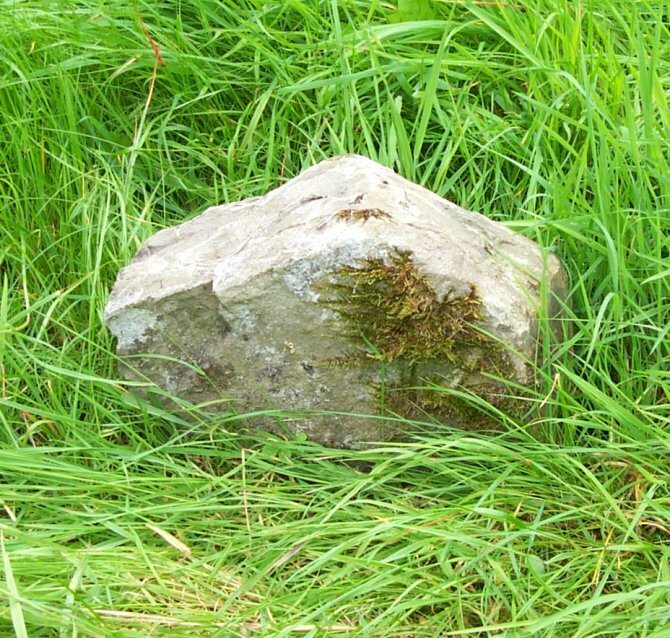 And James, the erector of this stone, who died 30th Aprile 1815, aged 28 years. 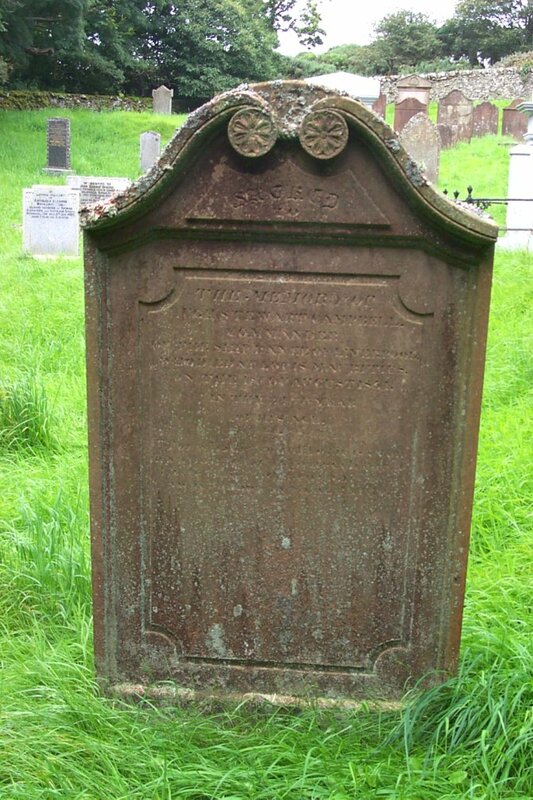 Also William, who died 20th Dec ‘r 1818, aged 34 years. (Rear) Also Isobella Taggart, spouse to Samuel Brown, who died 23rd Jan’y 1826, aged 75 years. And Mary Brown, their grand-daughter, who died 25th July 1824, aged 20 years. 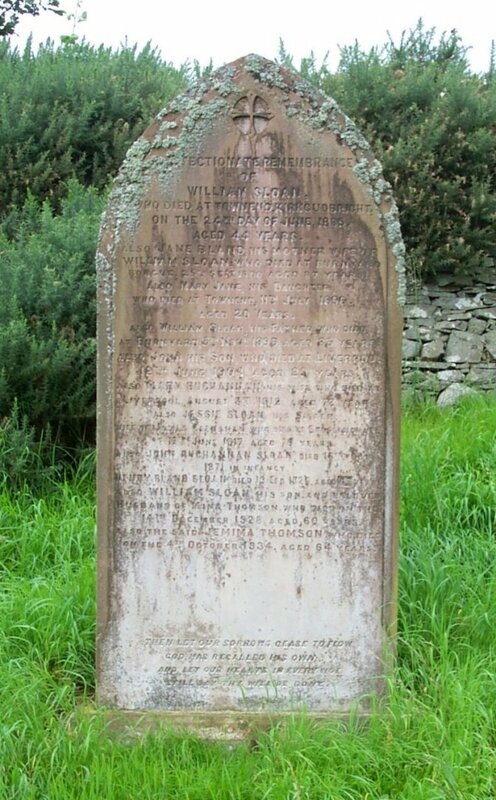 60 In memory of William Brown, who died at Argrennan, in the Parish of Tongland, on the 3rd of Sept. 1821, aged 75 years. 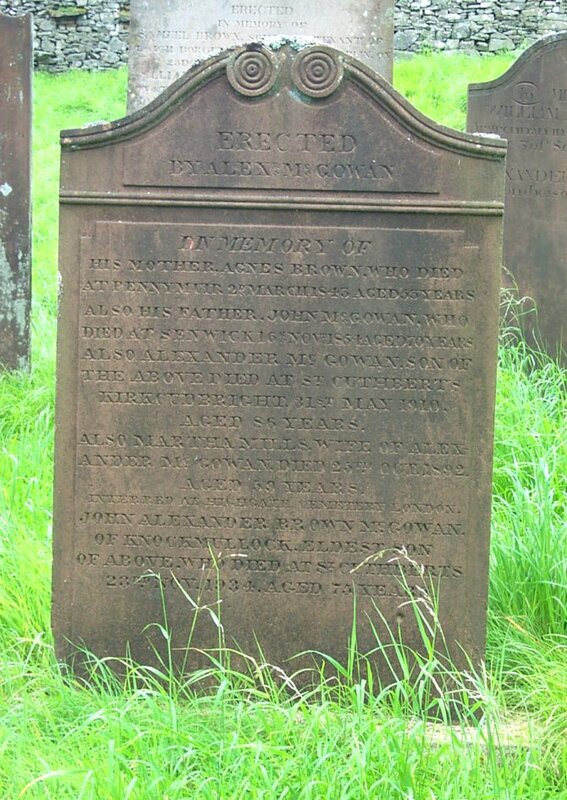 Also Alexander Brown, his son, who died on the 18th of May 1810, aged 18 years. 61 Erected in memory of Samuel Brown, sometime tenant of Laigh Borgue, who died at Graplin on the 23rd August 1805, aged 42 years. 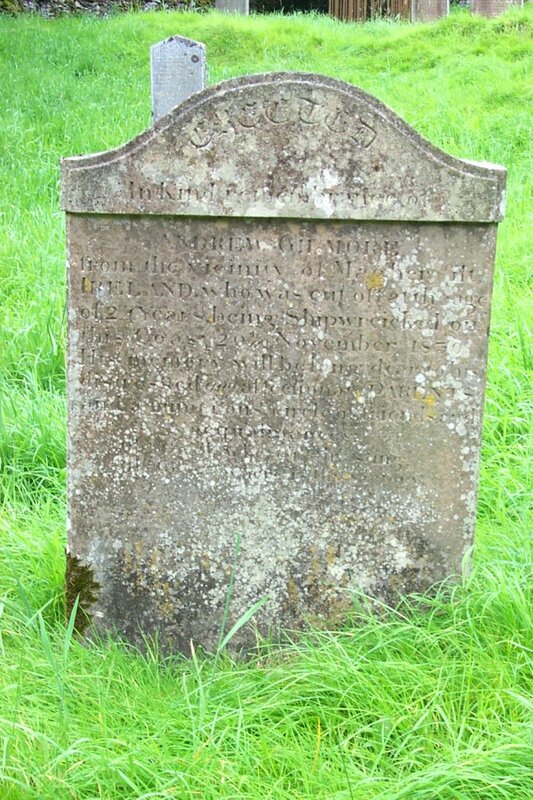 William, his son, who died at Graplin on 4th June 1816, aged 10 years and 6 months. Mary, his daughter, who died there on 6th April 1830, aged 29 years. Mary Sproat, his relict, who died there on 17th June 1844, aged 77 years. Thomas, agent for the Bank of Scotland and writer in Castle Douglas, their son, who died there on 24th November 1854, aged 58 years. Samuel, merchant in Doncaster, their son, who died there on 13th December 1855, aged 57 years. 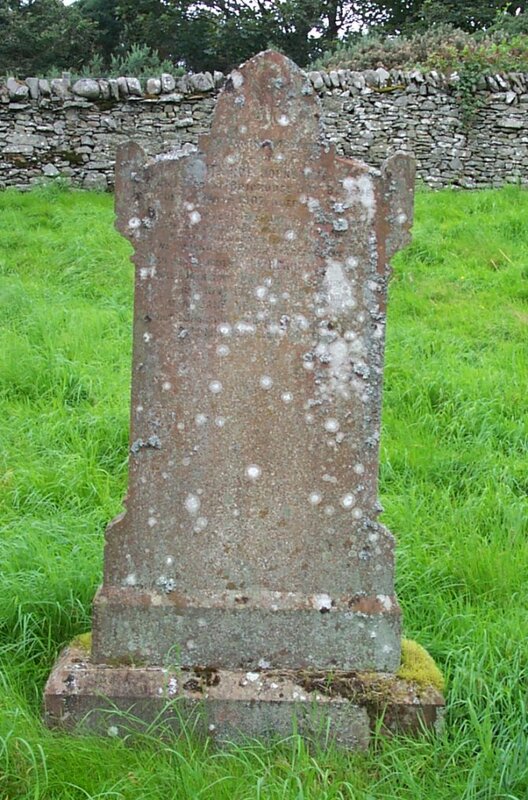 Margaret, their daughter, who died at Knockmullock on 10th December 1874, aged 82 years. Alexander, their eldest son, who died at Milton, Ontario, on 13th November 1876, aged 82 years. Also John Brown, of Knockmullock, their son, who died at London on 2nd June 1878, aged 75 years. 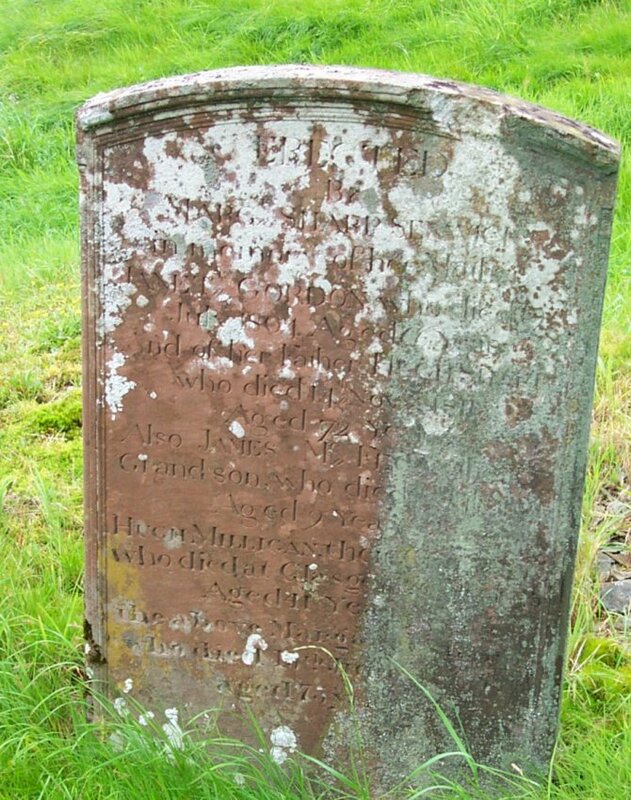 62 To the memory of Agnes Gordon, spouse to David Brown, who died in Boreland of Anwoth, 9th Sept’r 1812, aged 40 years. Also the said David Brown, who died 21 Feb’y 1828, aged 52 years. 63 In loving remembrance of John Carson, the beloved son of James and Agnes Carson, who died 15th Dec. 1890, in the 24th year of his age. 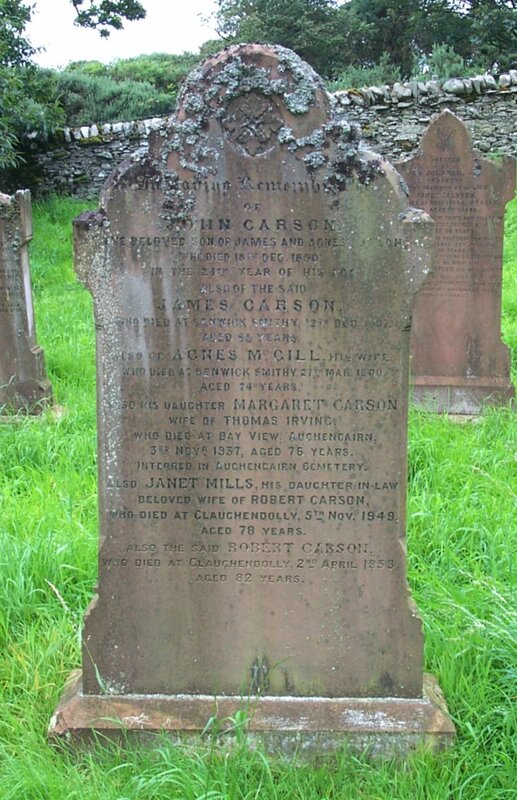 Also of the said James Carson, who died at Senwick Smithy, 12th Dec. 1897, aged 65 years. 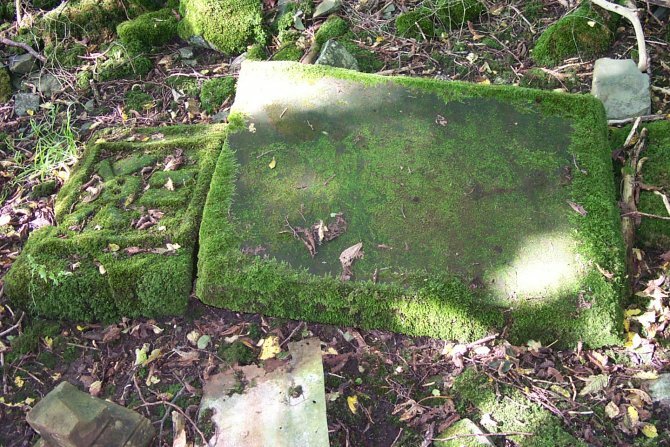 Also of Agnes McGill, his wife, who died at Senwick Smithy, 27th Mar. 1900, aged 74 years. Also his daughter Margaret Carson, wife of Thomas Irving, who died at Bay View, Auchencairn, 3rd Nov’r 1937, aged 76 years, interred in Auchencairn Cemetery. Also Janet Mills, his daughter-in-law, beloved wife of Robert Carson, who died at Clauchendolly, 5th Nov. 1949, aged 78 years. Also the said Robert Carson, who died at Clauchendolly, 2nd April 1953, aged 82 years. 65 (left) In memory of John, son of Edmund Gasson of Rye, Sussex, who died 10th May 1822, aged 2 years. Also Elizabirth (sic) Gasson, who died 10th Jan’y 1823, aged 1 year. 66 In loving memory of Elizabeth Helen, daughter of John Papple, who died in Borgue Village, 21st Oct. 1913, aged 20 years. Also John Houston, their son, who died at Ross, Borgue, aged 13 months. Also Alexander, his son, L.Cpl., 1st Canadian Mounted Rifles, killed in action at Ypres, 2nd June 1916, aged 29 years. 68 Sacred to the loving memory of Helen Mitchell, daughter of Robert and Jane Mitchell, who died at Senwick Cottage, 18th May 1897, aged 24 years. “Come unto me all ye that labour and are heavy laden and I will give you rest.” Matt. X1.28. The above Robert Mitchell, who died at Rutherford Cottage, Anwoth, 15th May 1916, aged 78 years. Jane Williamson, his wife, who also died there, 9th Dec. 1919, aged 81 years. 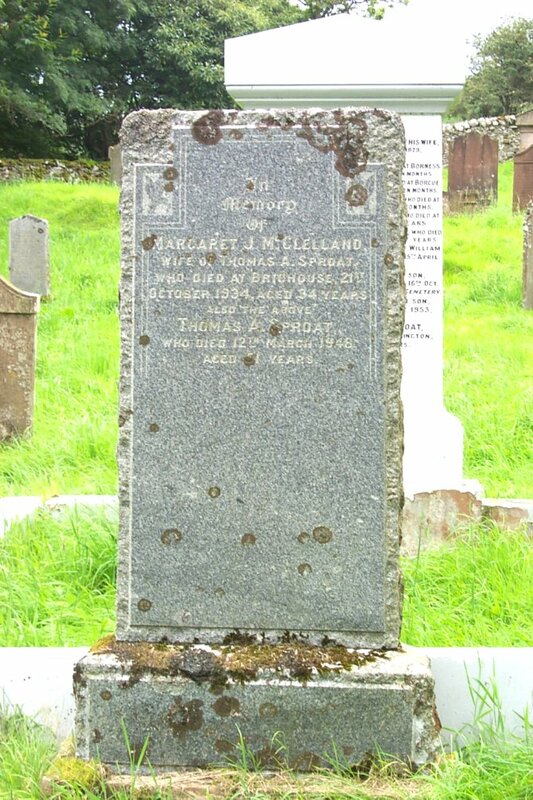 Margaret Ann Mitchell, their daughter, who died at Cottage Hospital, Kirkcudbright, 3rd Nov. 1950, aged 82 years. 69 Erected by John Neil, in loving memory of his wife, Janet Manson, who died at Brighouse, 6th Sept. 1899, aged 50 years. Also James, their third son, killed in action at Vimy Ridge, France, 9th April 1917, aged 36 years, Also Robert, their youngest son, killed in action in France, 29th July 1918, aged 30 years, interred at Oulghy-le-Chateau, S.S.E. of Soissons. “They died that we might live.” Also Mary Thompson, his wife, who died at Boatcroft, 15th June 1923, aged 52 years. Also the above John Neil, who died at Glenlochar, 12th November 1935, aged 85 years. 70 In loving memory of George Johnstone, who died at Brighouse Bay, Borgue, on 8th Nov. 1907, aged 72 years. “Rest on dear husband, thy labours o’er, thy willing hand will toil no more, a faithful father, true and kind, no friend on earth like thee we find.” Also his daughter Margaret, and wife of James Johnstone, who died at Senwick Park, 19th Nov. 1927, aged 49 years. Also Jane Neil, wife of the above George Johnstone, who died at Senwick Park, 22nd May 1928, aged 89 years. 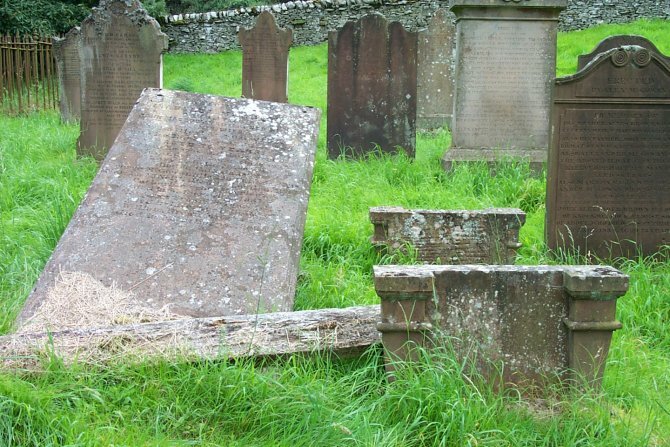 71 To the memory of Agnes Brown, daughter of John Brown and Jane Martn, who died at Irelandton, 13th March 1822, aged 24 years. And James Brown, their son, who died at Horsham, in Sussex, 20th June 1822, aged 20 years. And John Brown, their son, who died at Irelandton, 18th July 1833, aged 27 years. Also John Brown, sen’r. who died at Littleton, 17th Jan’y. 1835, aged 67 years. 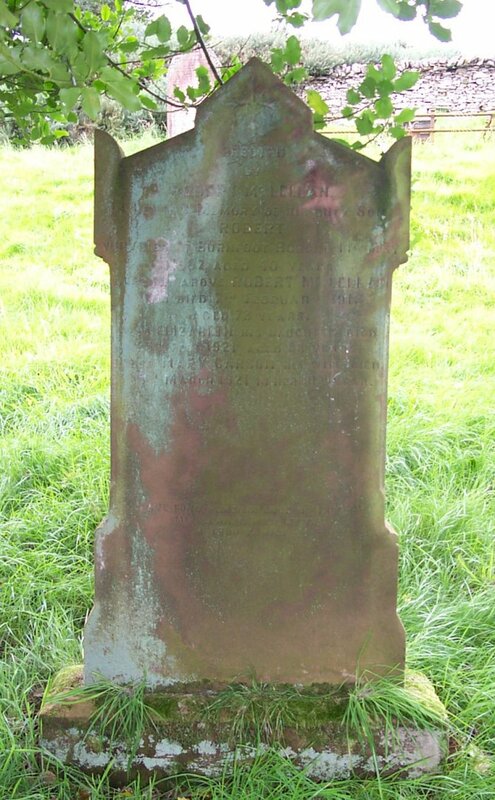 Alex’r, their son, who died at Holmfirth, Yorkshire, 10th Feb’y 1843, aged 42 years. Also William Brown, who died at Ringford, 5th March 1884, aged 68 years. Also Janet Martindale Cowper, his wife, who died at Creamery Cottage, 26th January 1913, aged 83 years. 72 This stone was erected by Andrew Carter, in memory of Mary Brown, his affectionate wife, who died at Stroans of Kirkmabreck, 6th Nov’r 1842, aged 31 years. Mary, their daughter, who died 25th July 1842, aged 3 months. Jane Martin, wife of John Brown, who died at Stroans, Parish of Kirkmabreck, 8th September 1866, aged 88 years. Andrew Carter, the erector, who died at Stroans, 8th September 1872, aged 70 years. 74 In memory of Margaret Roy, wife of James Campbell in Meikle Ross, who died on the 8th October 1848, aged 33 years. Also George Campbell, their son, who died on the 19th October 1848, aged 13 days. Also the said James Campbell, who died at Meikle Ross, on the 2nd October 1852, aged 49 years. Alexander Campbell, son of the said James Campbell, who died at Kiora, near Ararat, Victoria, Australia, Aug. 21st 1870, aged 24 years. And James Campbell, who died at Ararat, Victoria, Australia, August 15th 1871, aged 28 years. 75 Sacred to the memory of a beloved sister, Charlotte, youngest daughter of the late Martin Rawling Osborne, of Saint Ives, in the county of Huntingdon, she died at Balmangan, on the 3rd of June 1854, aged 26 years. "Watch therefore, for you know neither the day nor the hour where in the son of man cometh." Matt. XXV, 13.